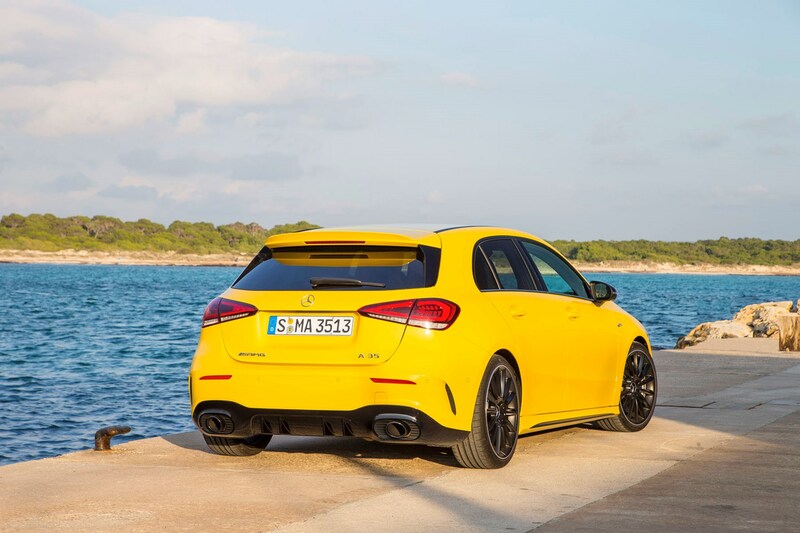 The A-Class’s engine choices were relatively sparse from launch, consisting of just one diesel and two petrol options. 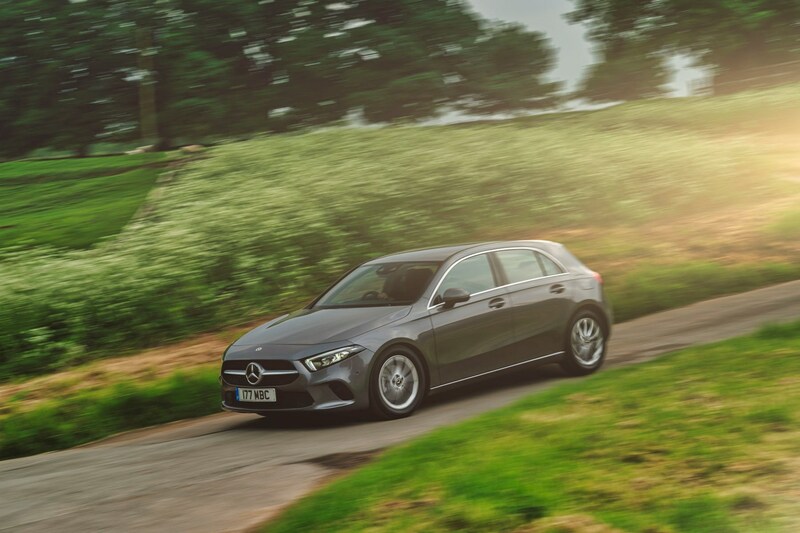 Fear not, as in Autumn 2018 the range was expanded to include two more diesels and an AMG performance variant, with further petrol and hybrid options on the way. 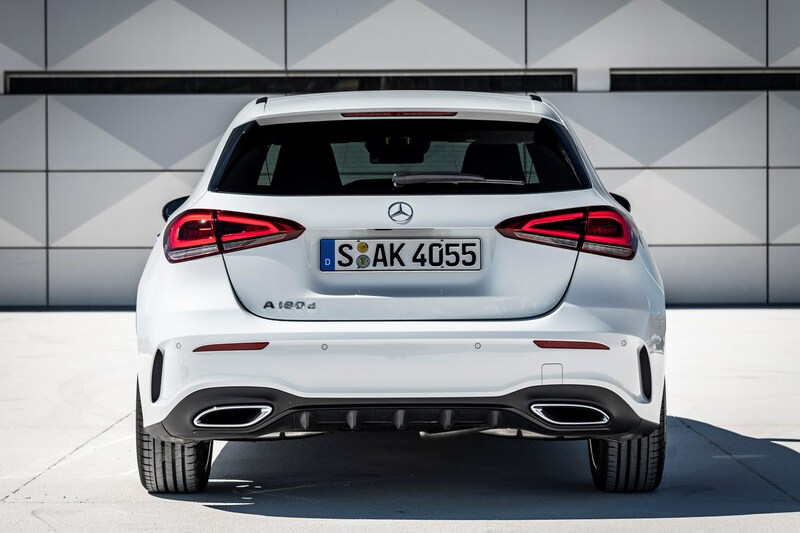 The base petrol engine on offer in the Mercedes-Benz A-Class is a 1.3-litre turbocharged unit, badged A 180. It produces 136hp and 200Nm of torque. 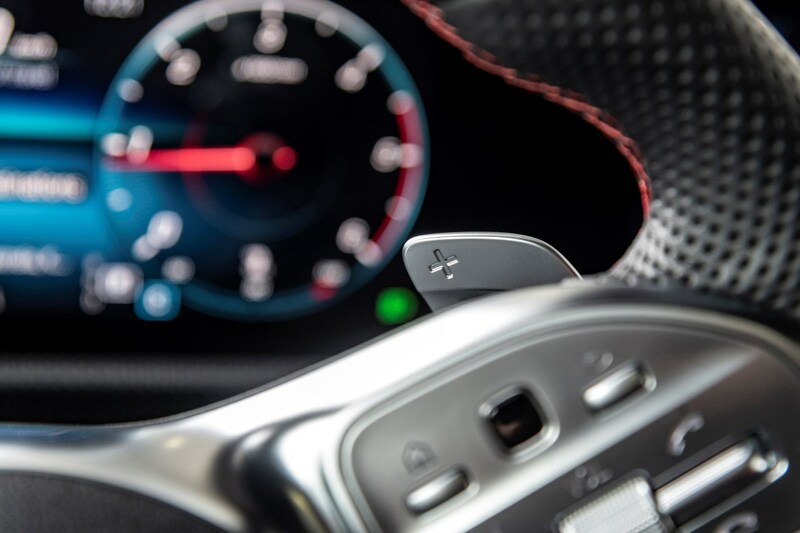 Acceleration takes 9.2 seconds from 0-62mph for the manual car, and 8.8 seconds in the auto. Top speed is 134mph. Next up is the A 200. 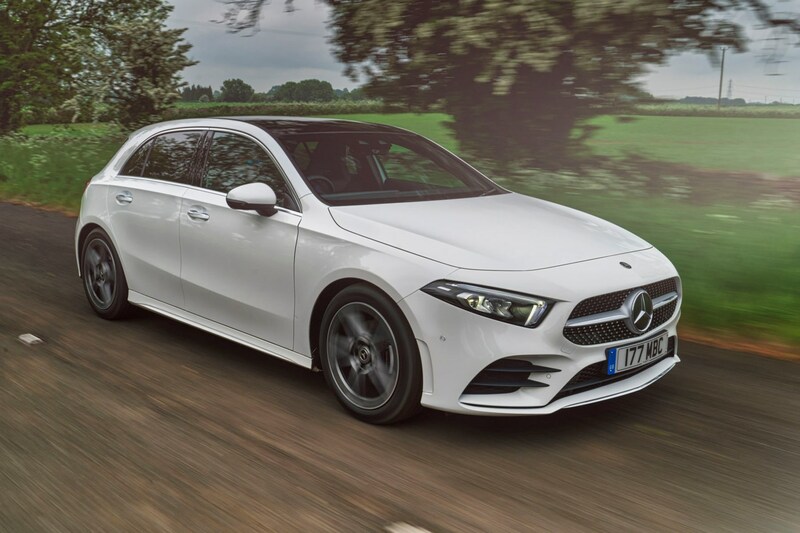 Offering up 163hp and 250Nm of torque, it’s good for 0-62mph in 8.2 seconds (manual, 8.0 seconds for the auto) and a top speed of 140mph. 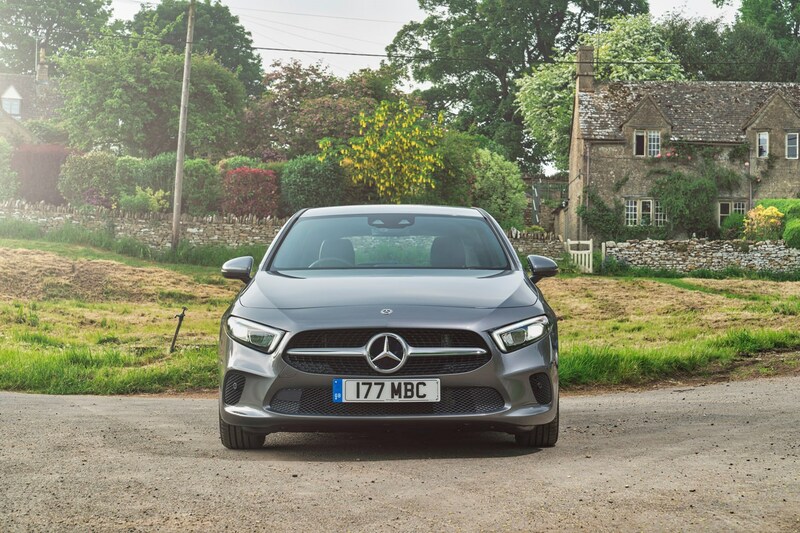 The 1.3-litre engine belies its small capacity by delivering reasonable real-world performance on all roads, though it is coarse and loud when worked hard – feeling out of place for a car that wears the Mercedes badge and the corresponding price premium. 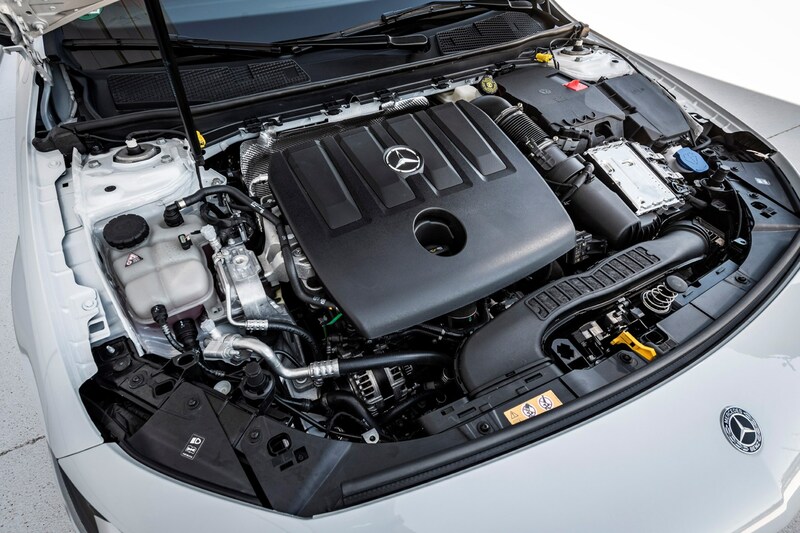 Ironically, it's the same engine found in the Nissan Qashqai and Renault Kadjar, being quieter in both of these cars than the Merc. While stopping short of feeling quick, there’s enough oomph to dispatch A-road overtakes or get up to speed quickly on a motorway slip road – more so, certainly, than the A 180 d. However, the automatic gearbox doesn’t feel as well matched to this engine as the diesel, changing gear more often – despite the petrol offering similar low-down oomph – and regularly shifting into a lower gear than is necessary, making the engine feel noisier than it really is. 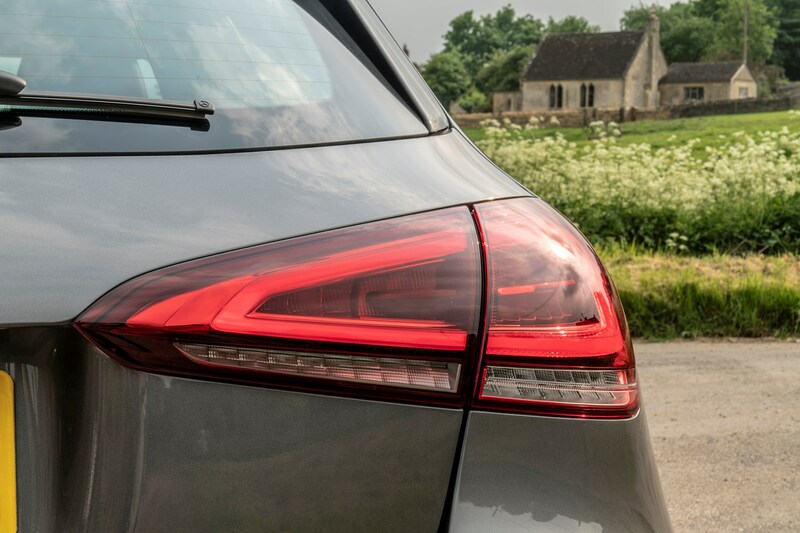 If you’re in need of something a little quicker, the 2.0-litre turbocharged petrol, badged A 250, delivers genuine Volkswagen Golf GTI-rivalling pace. 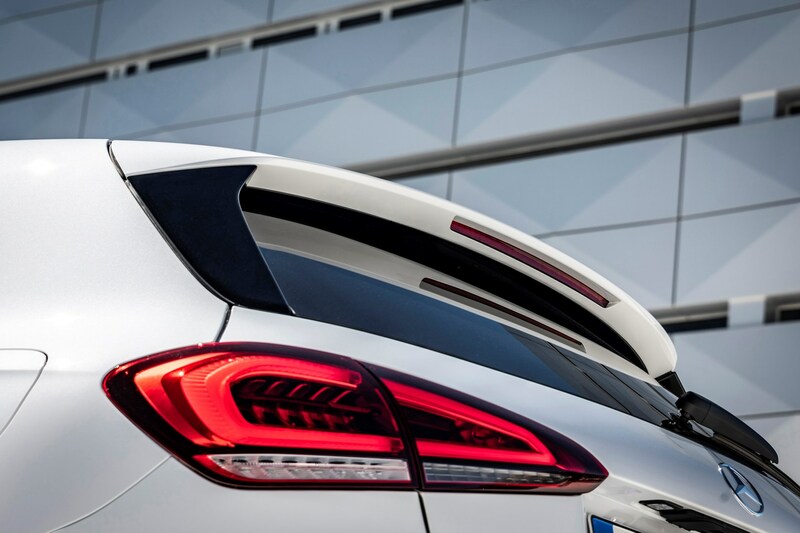 Producing 224hp and 350Nm of torque, 0-62mph comes up in just 6.2 seconds while the top speed is 155mph. 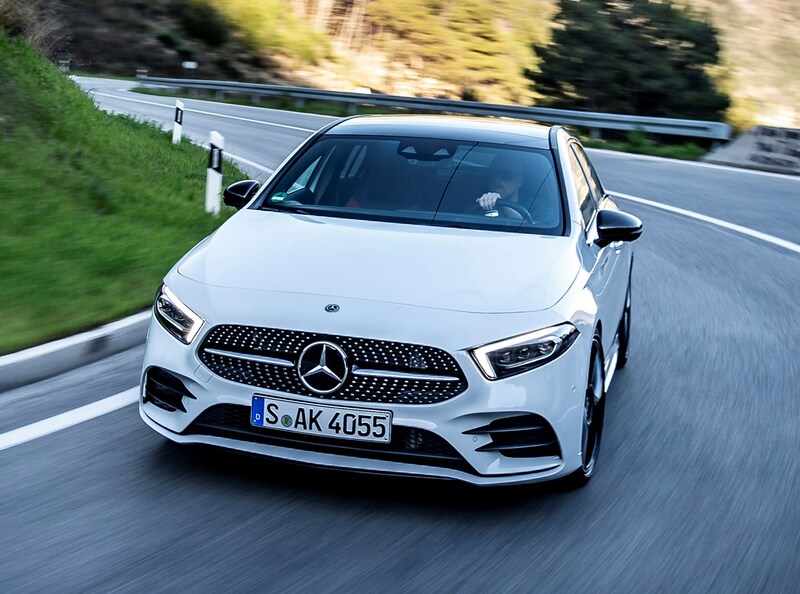 Until the AMG A-Classes comes along, the A 250 is expected to be the fastest derivative on offer. 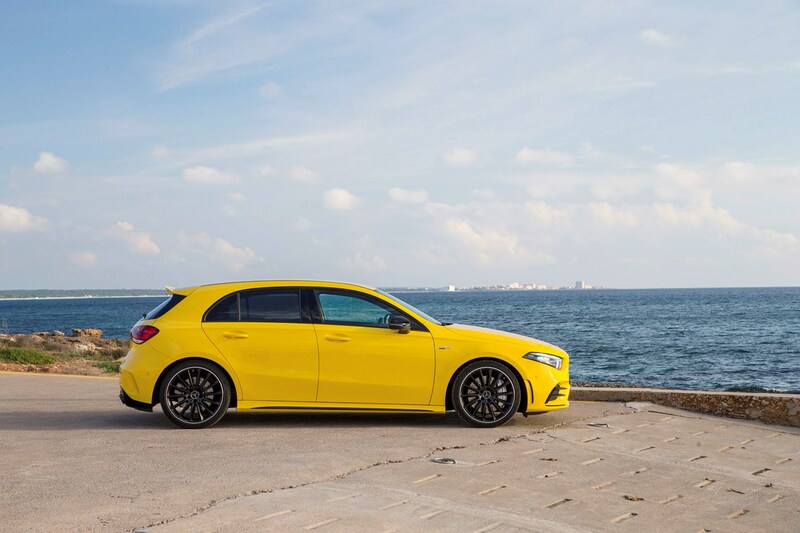 An A 220 was added to bridge the gap between A 200 and A 250, offering 190hp and 300Nm of torque, available in a choice of front- or 4Matic all-wheel drive forms. In both set-ups, it cracks the 0-62mph sprint in 6.9 seconds. 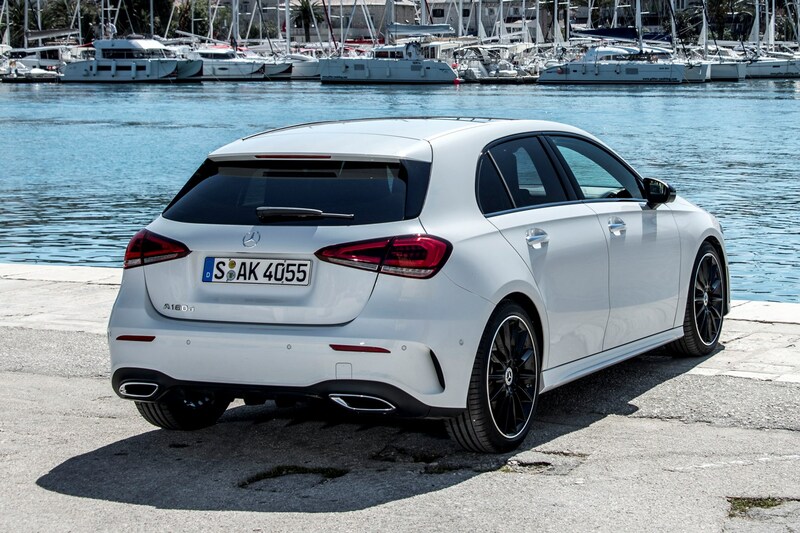 The A-Class is available with three diesel engine variants. 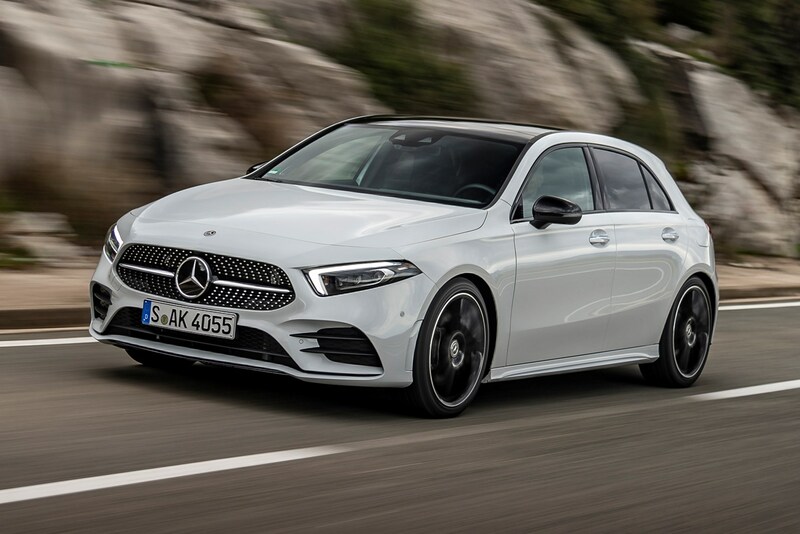 Starting off with the biggest seller, the A 180 d is a 1.5-litre four-cylinder turbocharged unit that puts out 116hp and 260Nm of torque. That’s enough for a 0-62mph time of 10.5 seconds and a top speed of 125mph. 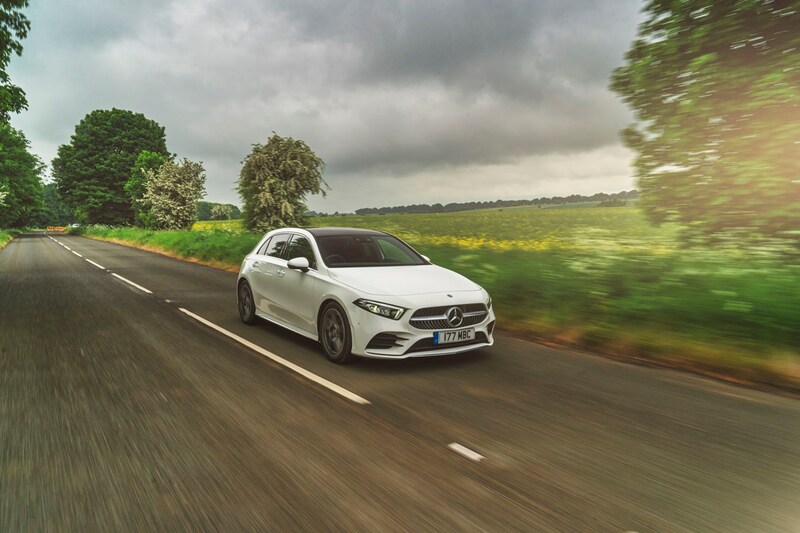 While it feels perky at low speeds – and has a surprisingly sensitive throttle pedal that makes it feel more responsive – the A 180 d doesn’t offer much in the way of speed. It’s not slow, but you do have to plan overtakes well in advance. 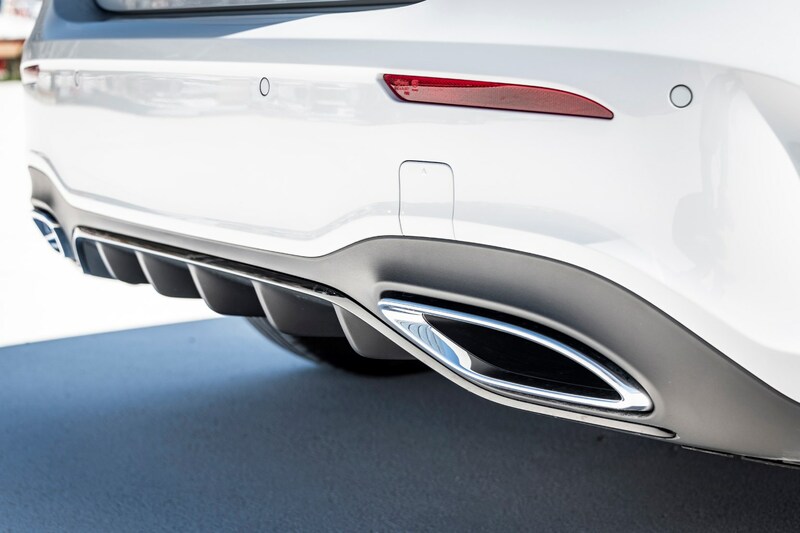 It’s fine for cruising – and will likely deliver excellent fuel economy in the process – but we can’t help but think that many drivers will be longing for just a little more real-world performance from this engine – especially considering the steep pricing. 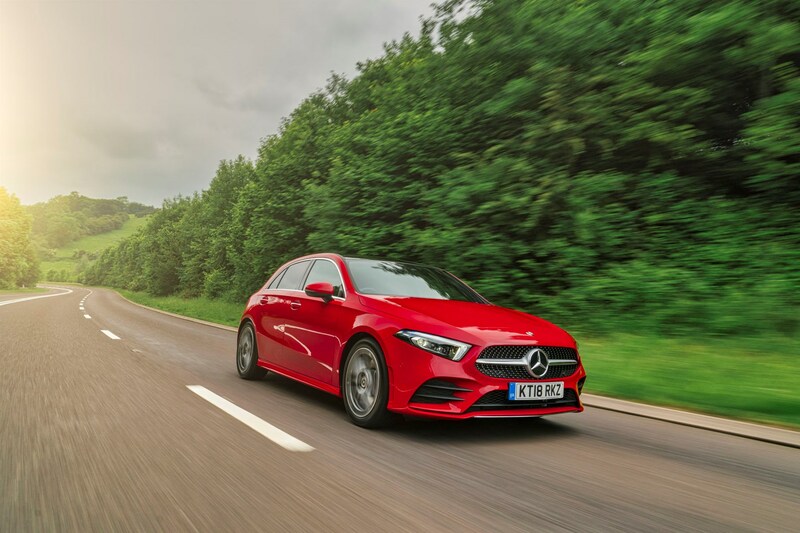 Upgrade to the A 200 d and you’ll benefit from a larger 2.0-litre engine producing 150hp and 320Nm of torque, enough for 0-62mph in 8.1 seconds and a top speed of 137mph. 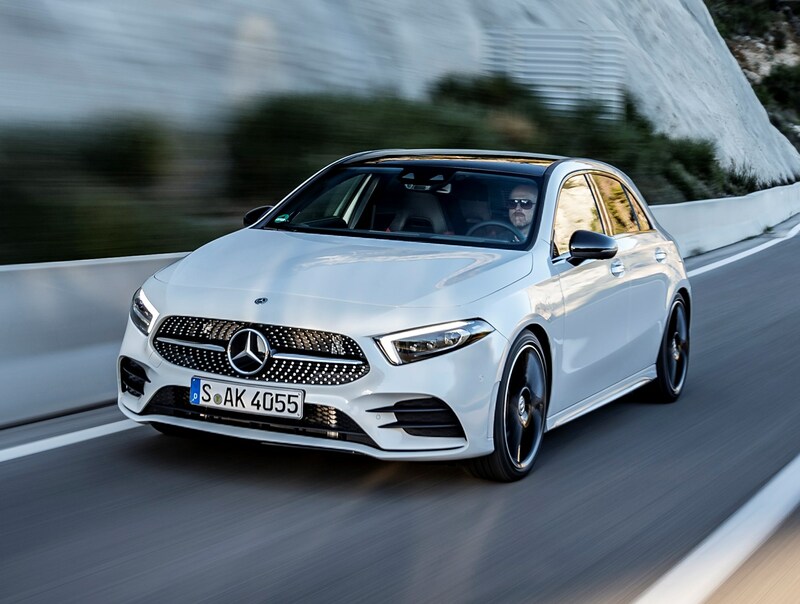 Meanwhile, the A 220 d uses the same engine to produce 190hp and 400Nm of torque, giving a 0-62mph time of 7.0 seconds and a top speed of 146mph. 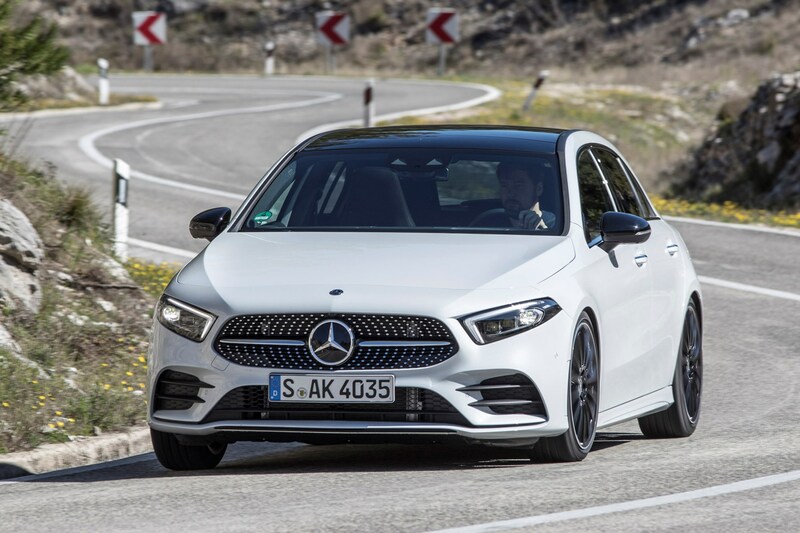 The sole transmission offering in the A-Class from launch was a seven-speed DCT (dual-clutch transmission) automatic, however an eight-speed and six-speed manual variant have since followed. 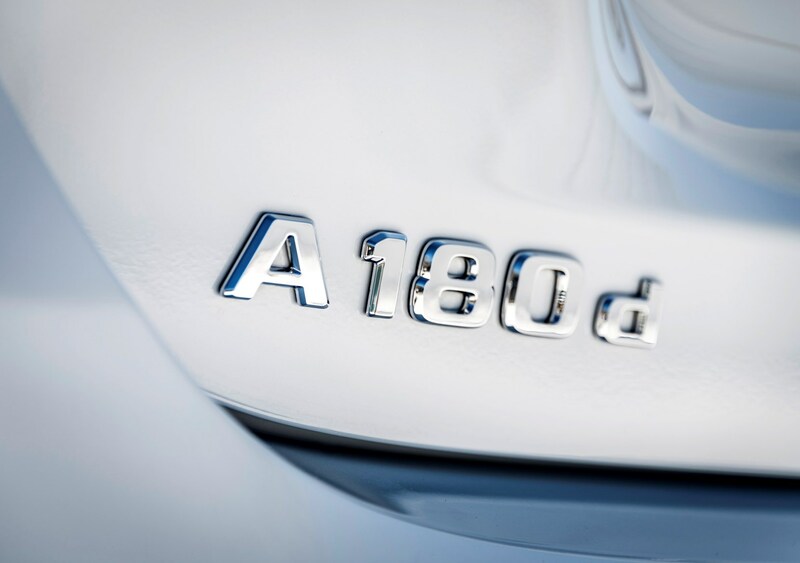 Keeping things confusing, the A 180 d uses the seven-speed auto, while the A 200 d and A 220 d use an eight-speeder. 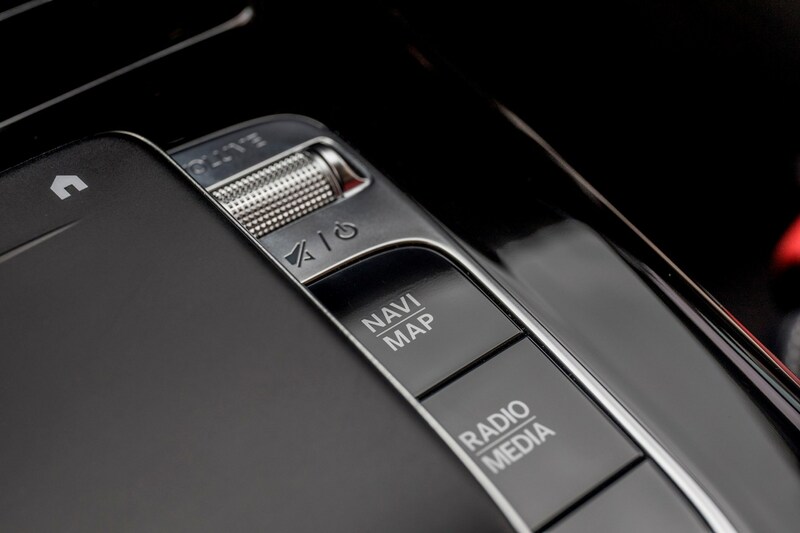 All the petrol automatics use the seven-speed auto where specified in place of the six-speed manual. 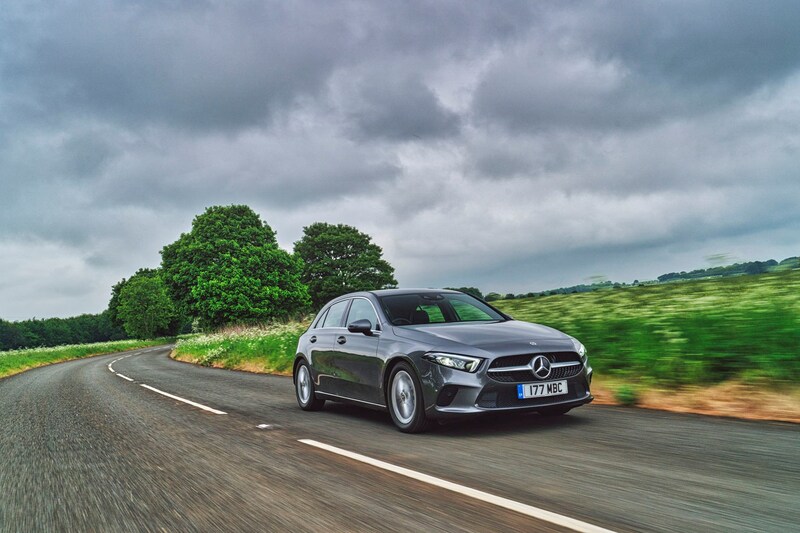 The seven-speed DCT is a slick-shifting unit that works particularly well with the A 180 d diesel, getting the most from the engine and changing gear mostly imperceptibly. 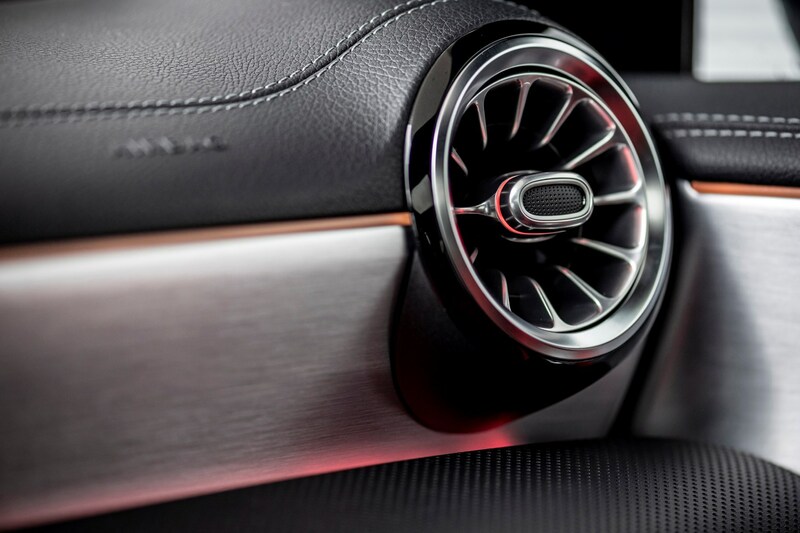 It does a good job of choosing gears for you, striking a good balance between shifting into a high gear when cruising for maximum economy and the least engine noise, and changing into a low enough gear for decent acceleration without whipping up too much engine noise. This transmission is much less suited to the A 200 petrol, however. 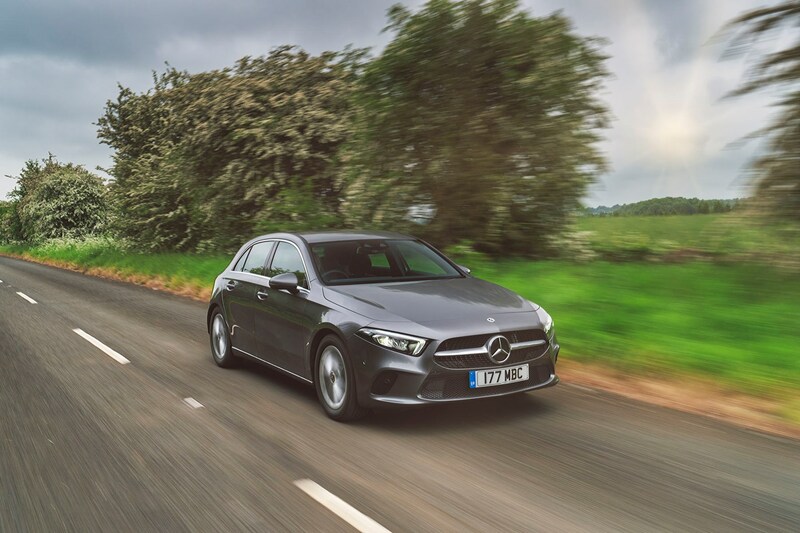 Despite this engine having a similar amount of low-down muscle to the diesel, the gearbox forever chooses a lower gear than you’d expect – resulting in much more engine noise than you’d expect. This wouldn’t be too much of a problem if the engine were smooth and quiet, but the A 200 motor is surprisingly coarse and loud. 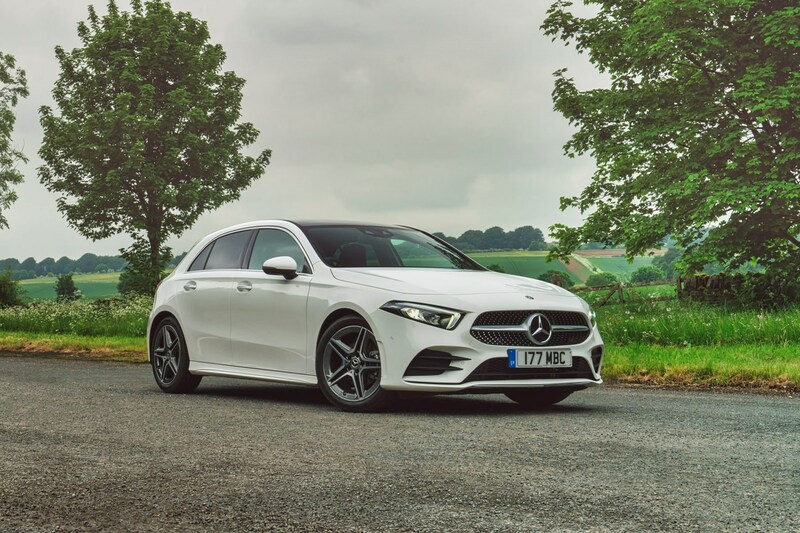 Take into account the accomplished general refinement levels and this engine and gearbox combination stands out as a weak link, feeling very out of place in a Mercedes complete with premium price tag. 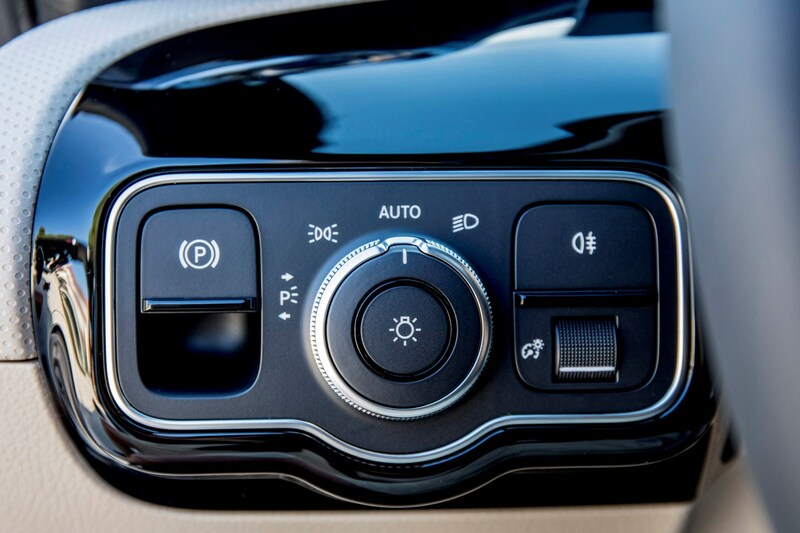 Yes, the gear selector is mounted on the steering column, but it doesn’t take long to get used to this and once you have it’s easy to use. 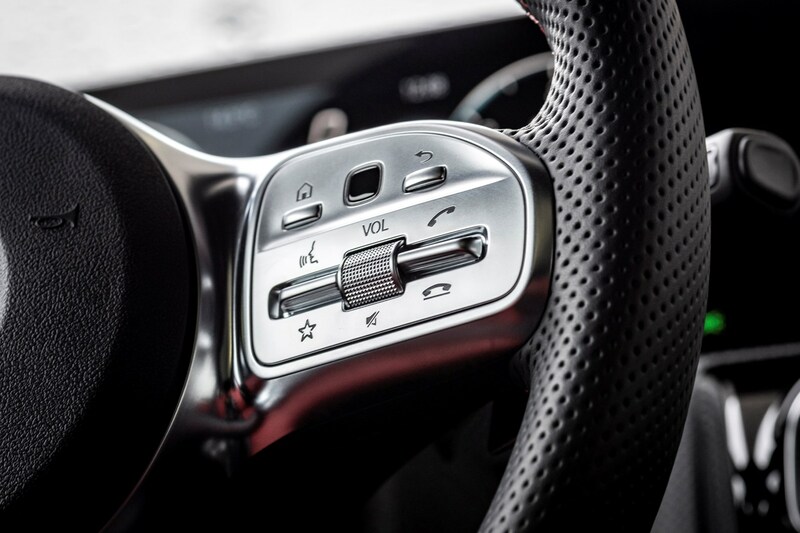 There are manual override paddles should you wish to change through the gears yourselves, and they’re impressively quick to respond, quickly knocking down two gears at a time if requested. 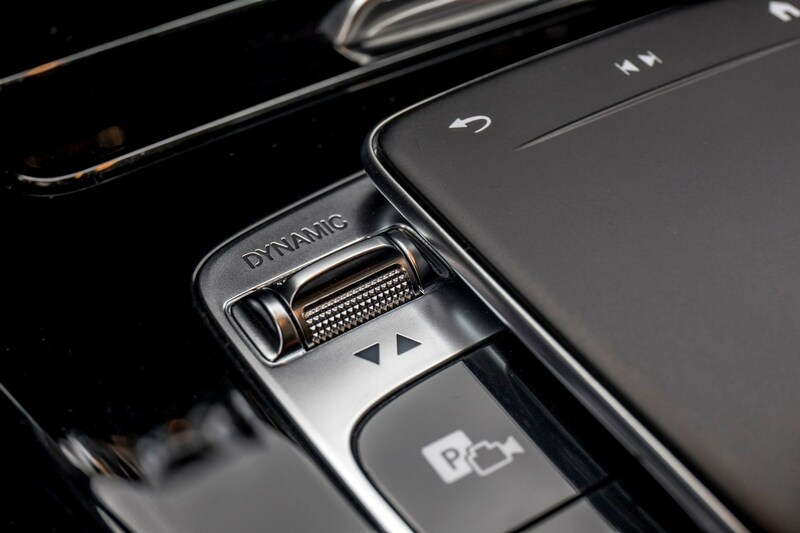 All A-Classes come with a drive mode selector as standard, allowing the driver to switch between Comfort, Eco, Sport and Individual settings (plus Slippery on AMG A 35 models). 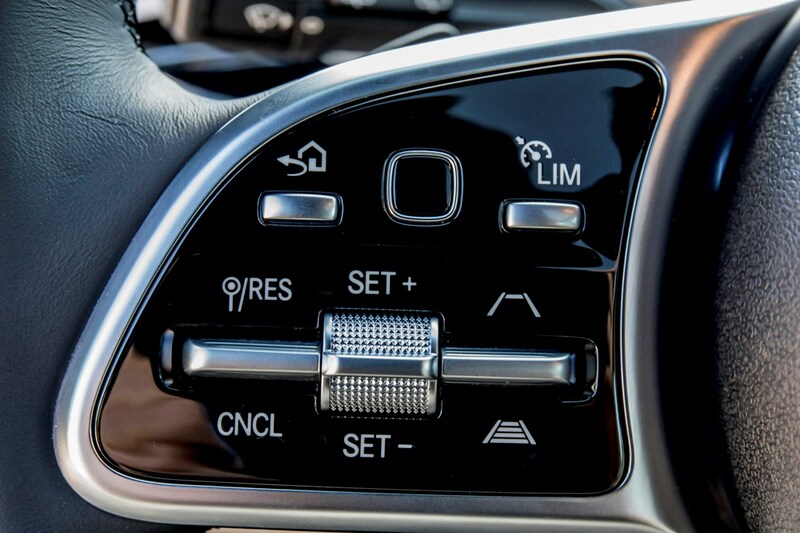 The former two lighten up the steering and dull the throttle responses, while Sport does the opposite and also reduces the ESP (electronic stability program) intervention. 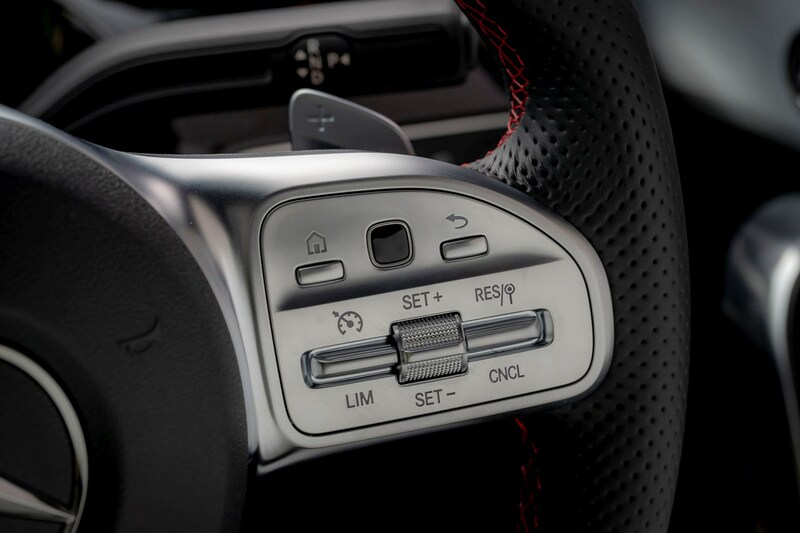 Individual allows drivers to tweak each setting independent of one another. 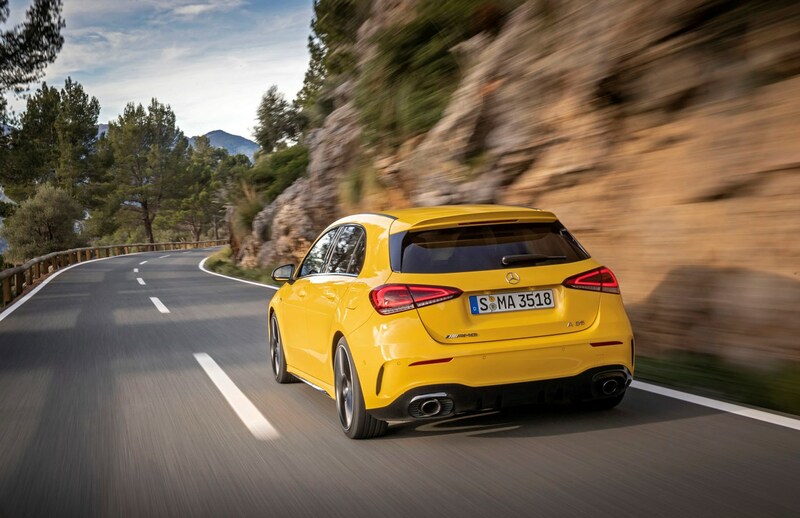 The top-of-the-range Mercedes AMG A 35 uses a 2.0-litre four-cylinder turbocharged petrol engine that produces 306hp and 400Nm of torque – enough for 0-62mph in 4.7 seconds and a top speed of 155mph. 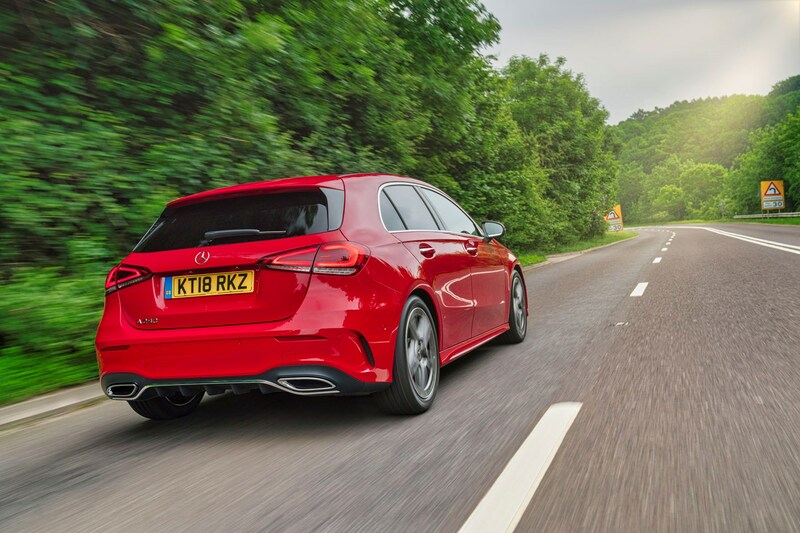 It’s an undeniably rapid engine, yet its short on outright excitement. 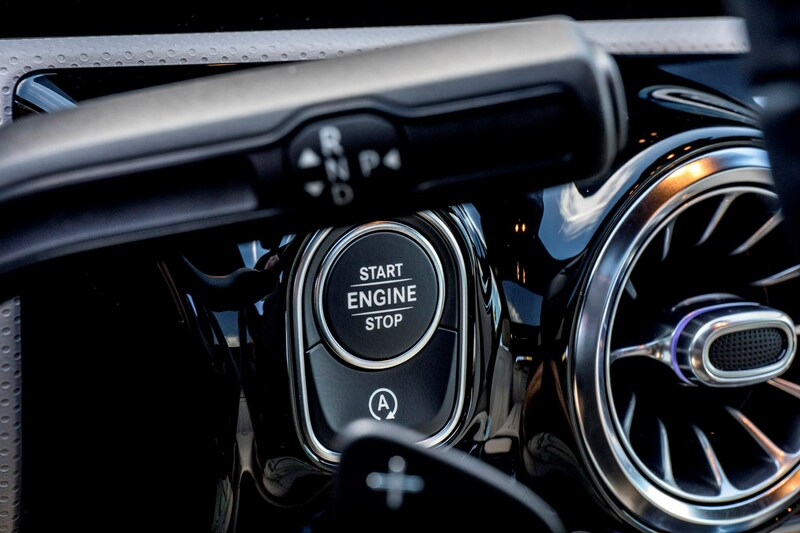 There’s nothing wrong with the power delivery or throttle responses, plus the gearbox does its part, too, yet the ability to thrill is lacking. 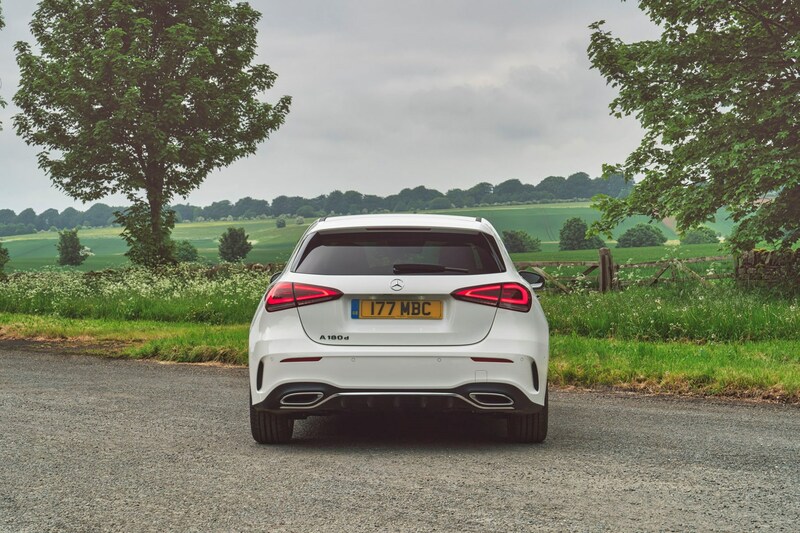 The overall engine noted feels artificial, and while it revs well you rarely feel encouraged to explore much beyond 5,000rpm thanks to the ample torque on offer. Effective, yes, exciting, no. 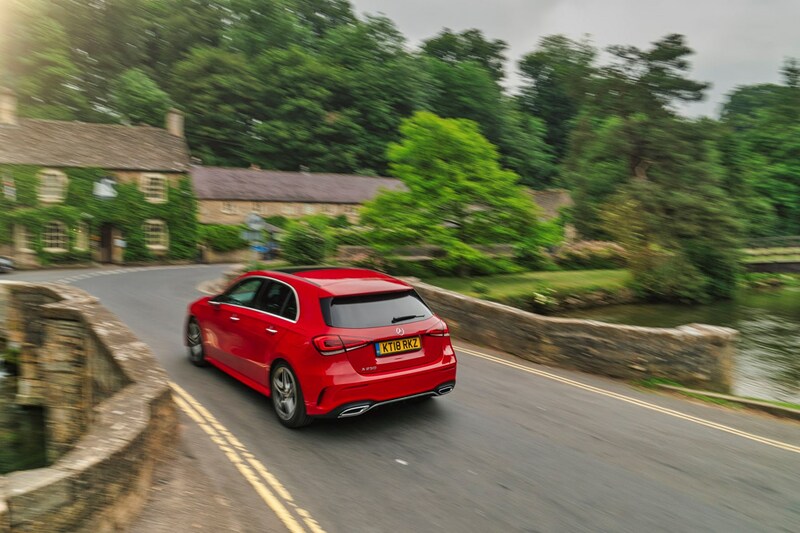 The A-Class isn’t as focused towards sporty driving as, say, a BMW 1 Series, but it still conducts itself well out on the road. 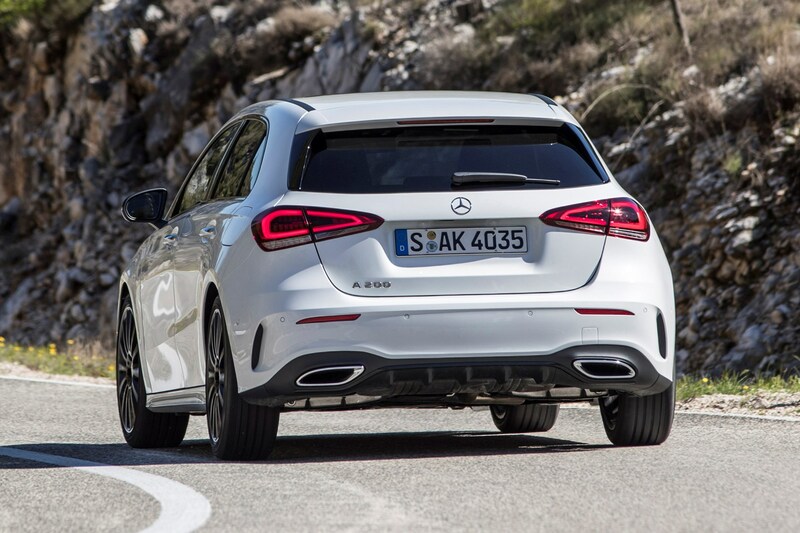 Bear in mind that the A-Class comes with different types of rear suspension, depending upon which version you go for. 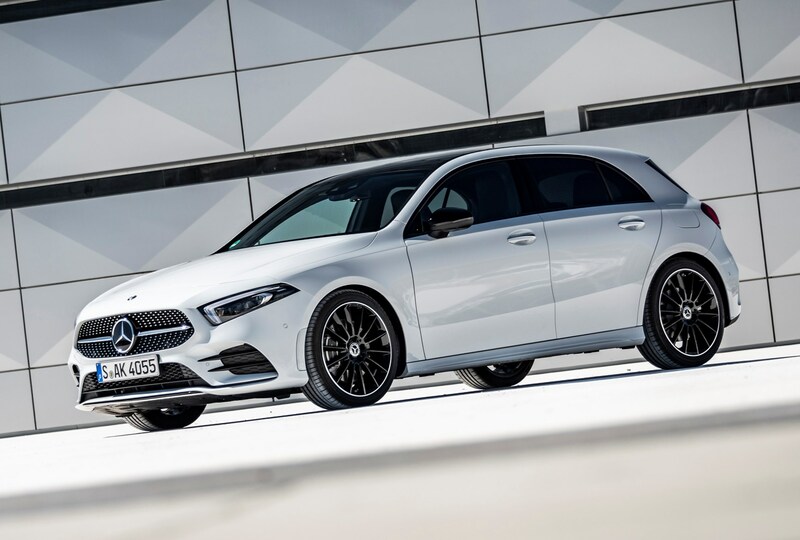 Pricier AMG Line models come with more sophisticated suspension, while SE and Sport trims use a cheaper configuration that doesn’t offer as accurate control of the back wheels. 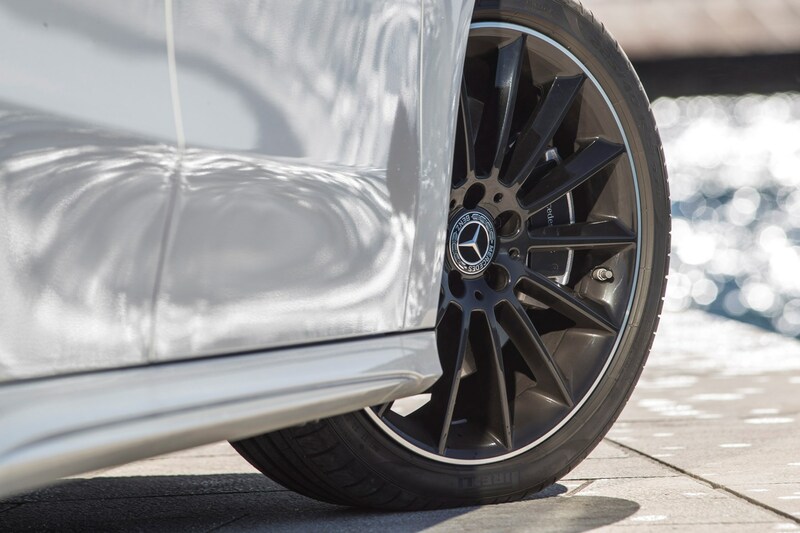 There’s not a world of difference between the two – especially as the more sophisticated suspension of the AMG Line models is offset by larger alloy wheels, which make the ride firmer. 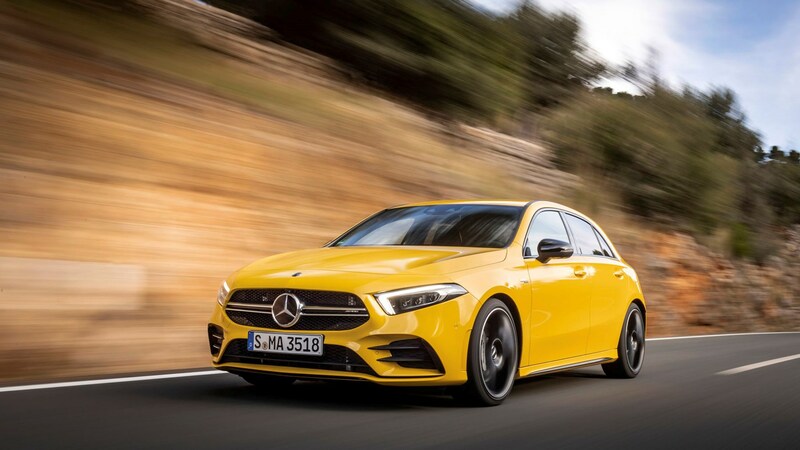 However, you can expect AMG Line versions to do a slightly better job of separating driver and passengers from rough tarmac than Sport models. 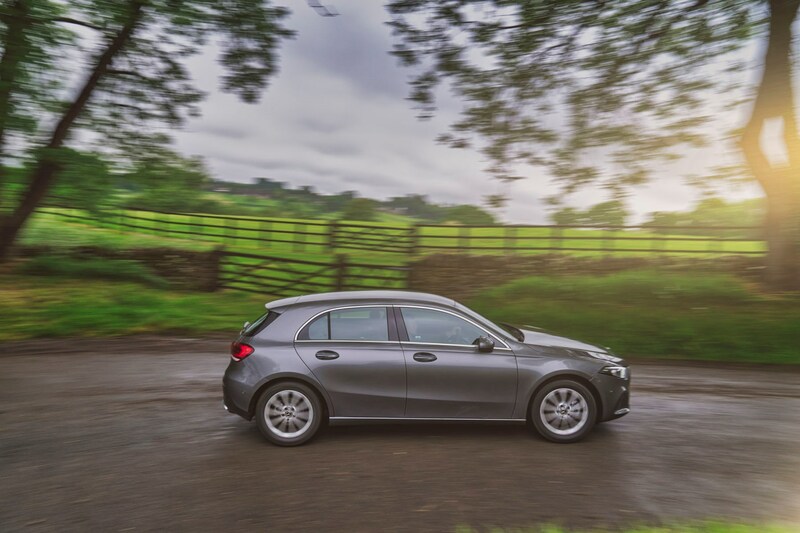 Around town, the seven-speed automatic gearbox means it’s easy to drive in heavy traffic, while the car’s exterior dimensions are still compact enough (this generation A-Class is longer and wider than the previous model) to thread through most narrow city streets. 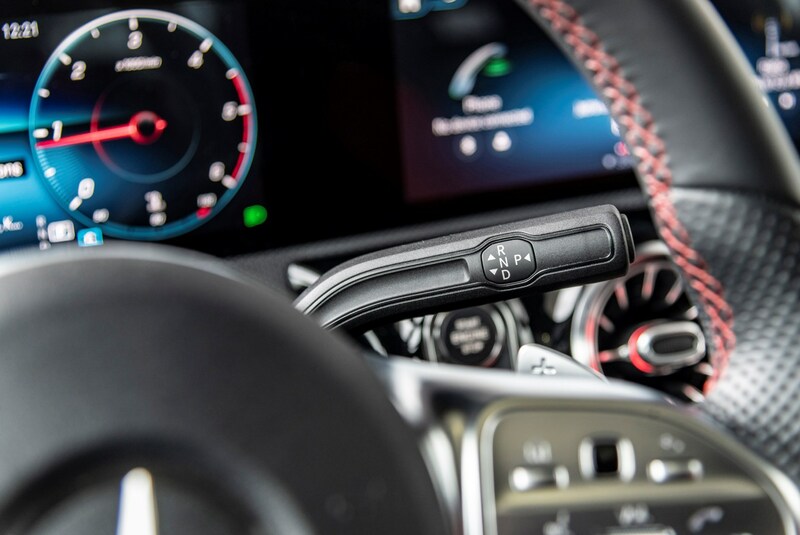 The turning circle is reasonably tight, and the steering light at low speeds, giving good overall manoeuvrability. 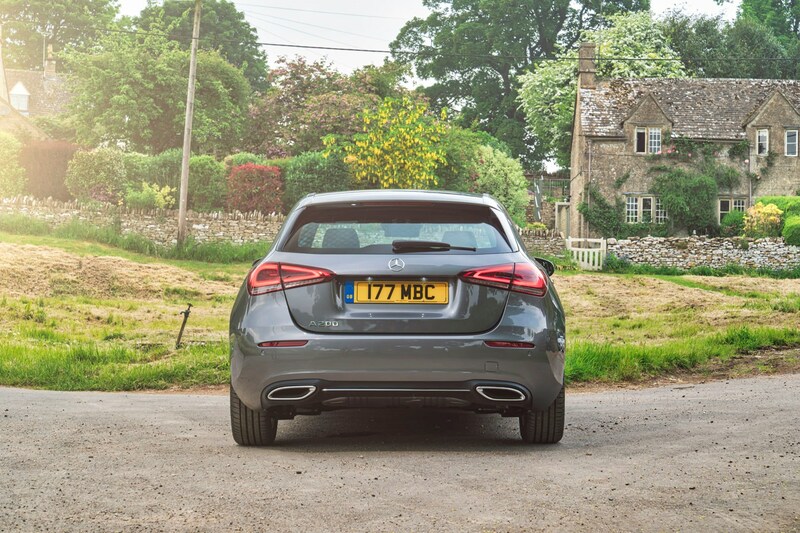 A rear-view camera is standard, though the large, fixed, solid rear headrests and broad rear pillars mean you have to rely on it to see where you’re going when reversing. 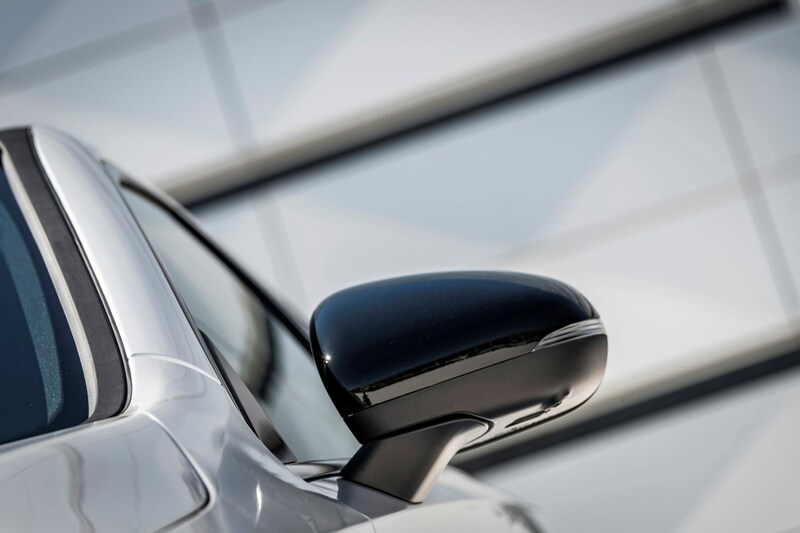 Automatic parking with a 360-degree camera view of the car is available as an option and works very well, even if it’s not strictly necessary. 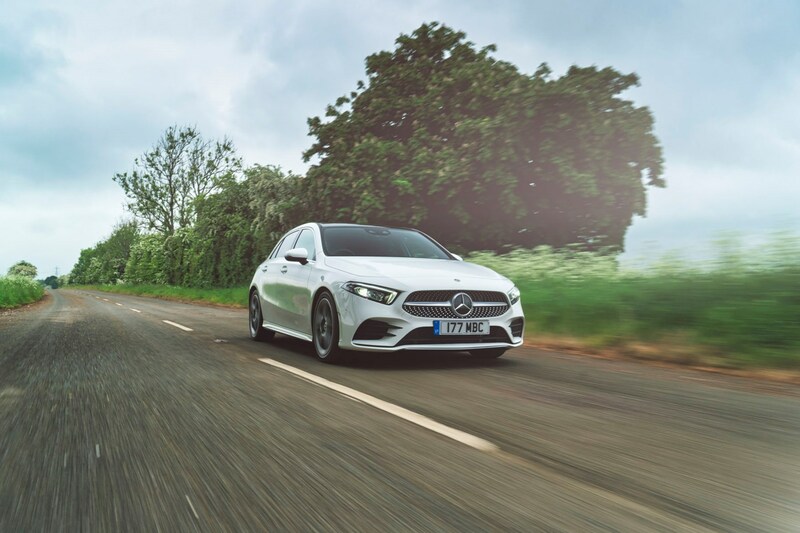 Gain a little more speed on a twisty country road and the A-Class displays ample stability and grip, even if the body does display a little roll at higher speeds. 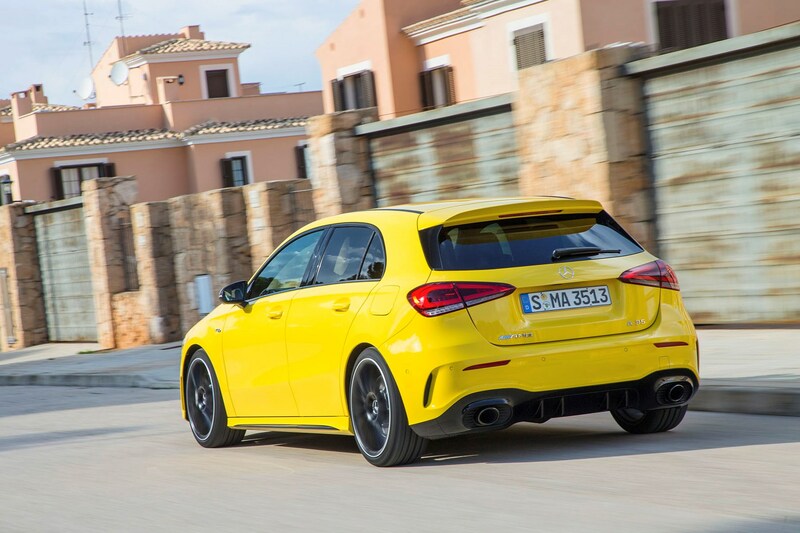 It’s not up there with some of its rivals for sheer responsiveness, but there’s enough feel and enthusiasm from the chassis to have some fun if you really want to. 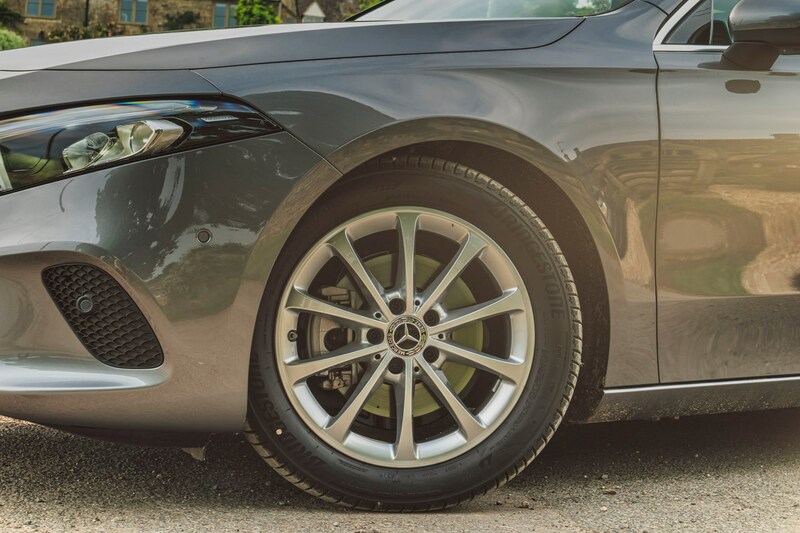 A significant part of this is thanks to the well-weighted steering which is reasonably weighty around corners but very smooth – providing a good sense of how much grip the front tyres have. 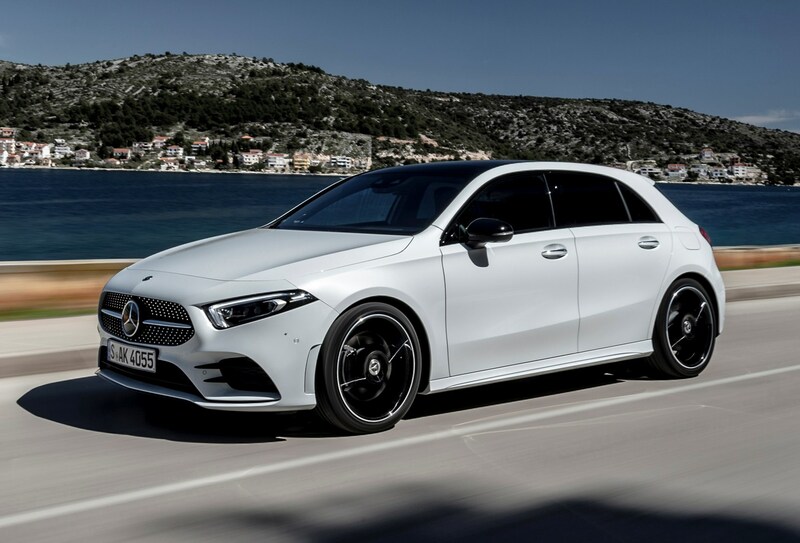 It’s likely that most of the time, however, the A-Class will be driven in town or on motorways and this is where it feels most at home. 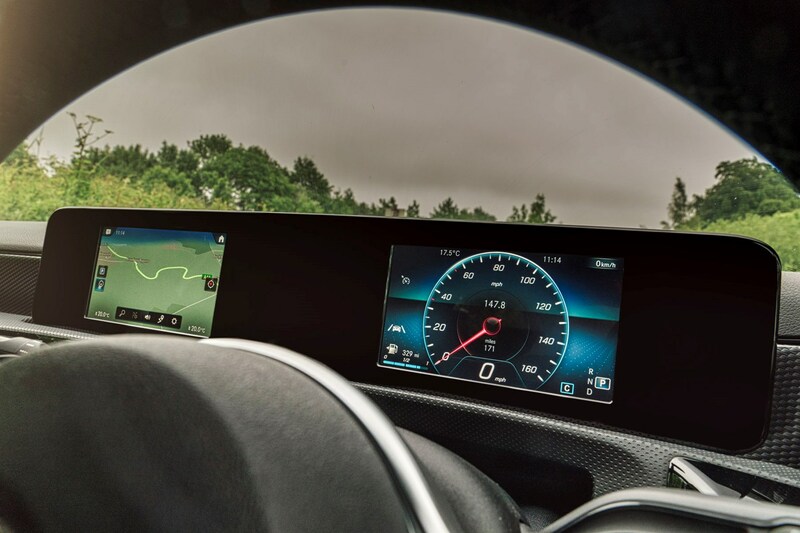 Cruising at high speed, you’d be forgiven for thinking you were driving a larger vehicle thanks to the very low wind noise from around the windscreen – though it does produce a lot of noise from around the rear windows. 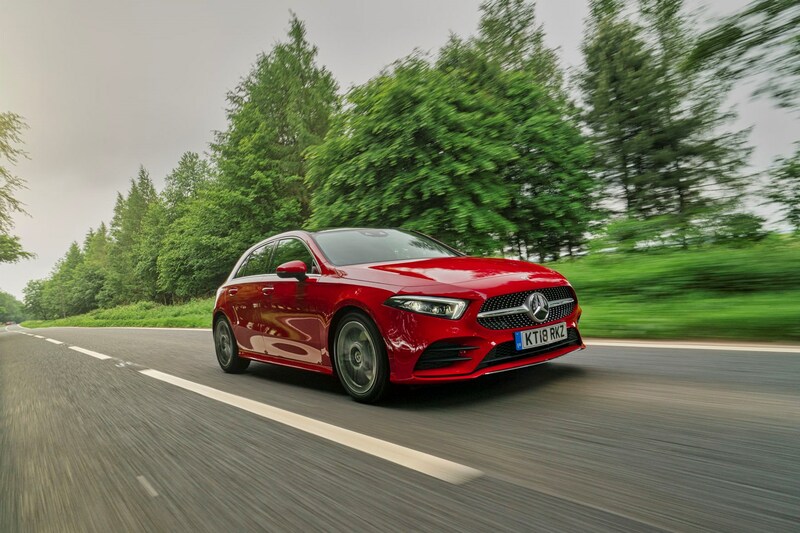 Boasting Mercedes-AMG’s 4Matic all-wheel drive with variable torque distribution, AMG Ride Control adaptive dampers and Dynamic Select drive modes, the AMG A 35 has all the tools to make it a full-on corner crusher. And thankfully, it doesn’t disappoint. Traction is immense, while the front wheels produce a huge amount of grip when turning into corners. 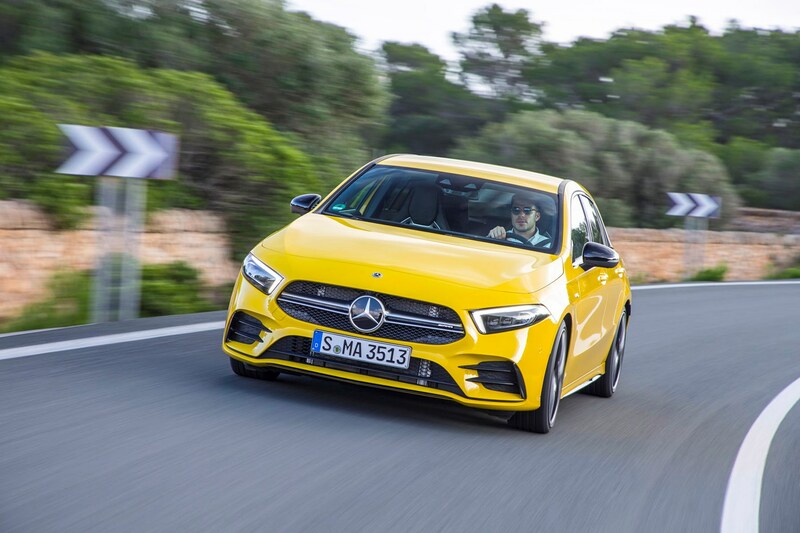 There’s also next to no understeer (where the front of the car pushes wide during cornering) or oversteer (when the rear of the car steps out during cornering), making the A 35 an incredibly tidy steer when hurtling from challenging bend to challenging bend. However, while all of the above is great for getting from A to B as quickly – and safely – as possible, it could do with being a little more fun. 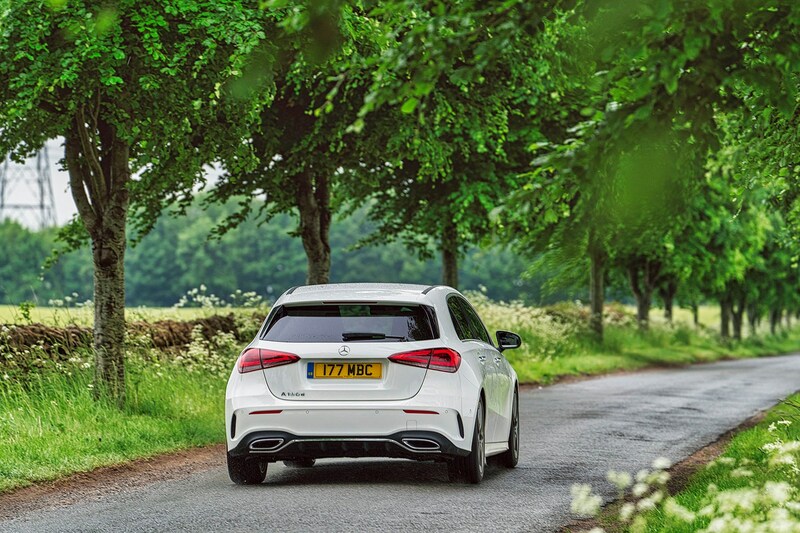 The chassis isn’t particularly adjustable – once you’ve picked a line through a corner there’s little chance of adjusting it on the throttle – plus there’s also the constant feeling that the car finds everything a little too easy. 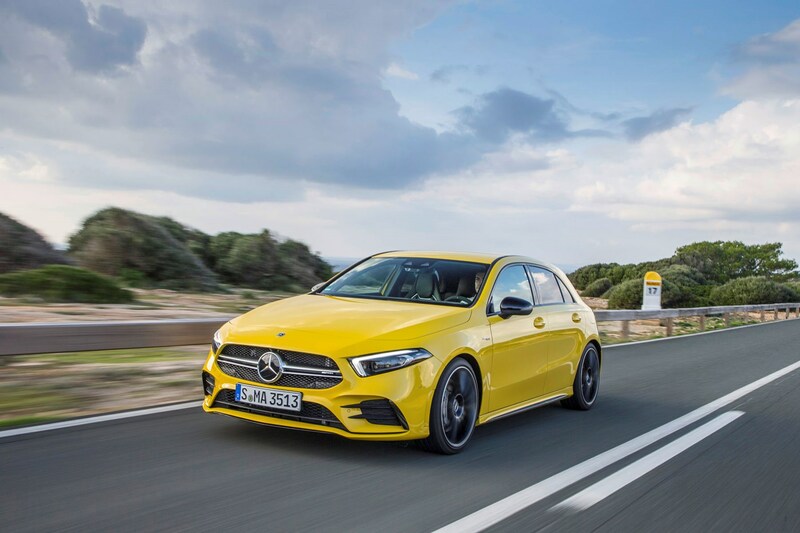 For enthusiastic drivers, this lack of communication through the chassis and controls means it’s not as an appealing proposition as a Honda Civic Type R, or even a Volkswagen Golf R.
Mercedes-Benz has gone all out on the A-Class’s cabin and it really shows. 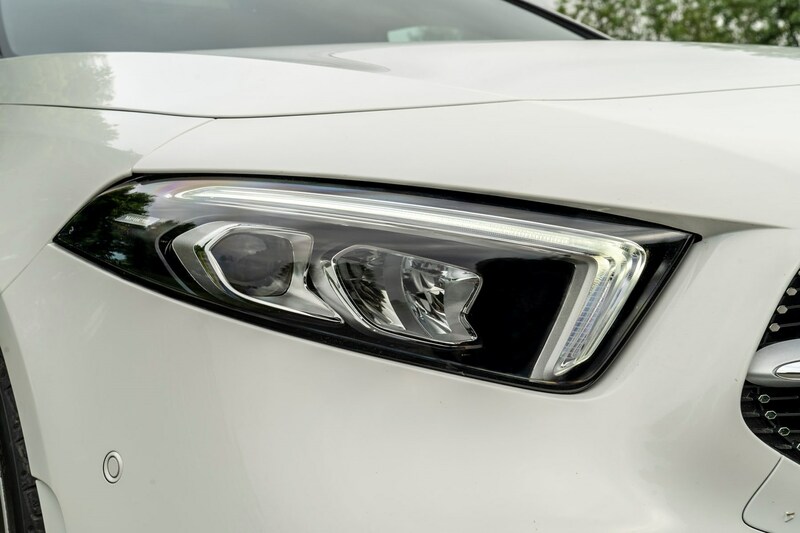 Demonstrating a marked improvement over the previous model, it’s easily the best in class for design and technology – although much of this will cost you extra. 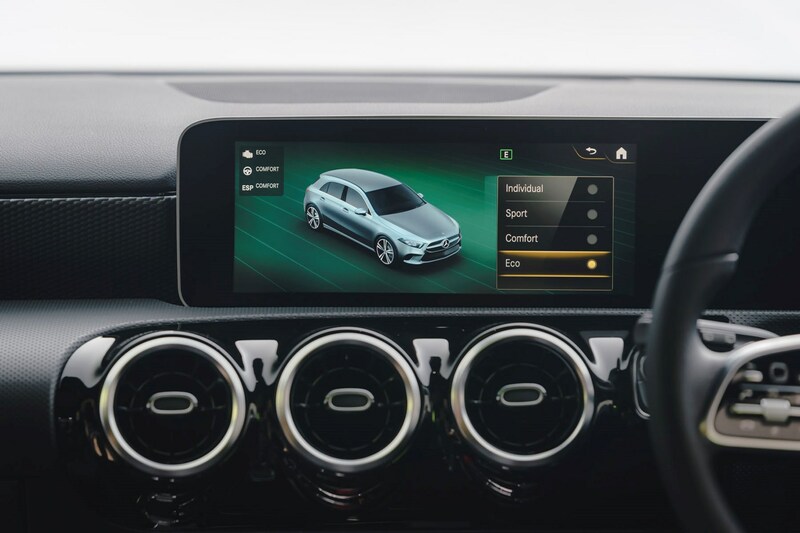 The A-Class comes with two 7.0-inch displays as standard – a central media system display and a widescreen driver display in place of regular dials. 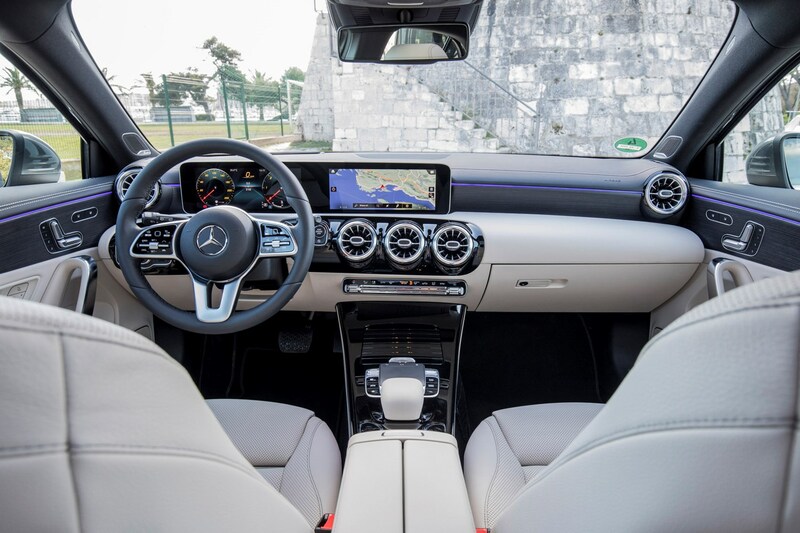 However, for the full effect, the Premium equipment line (available on Sport and AMG Line models) replaces the standard screens with larger, 10.25-inch displays. 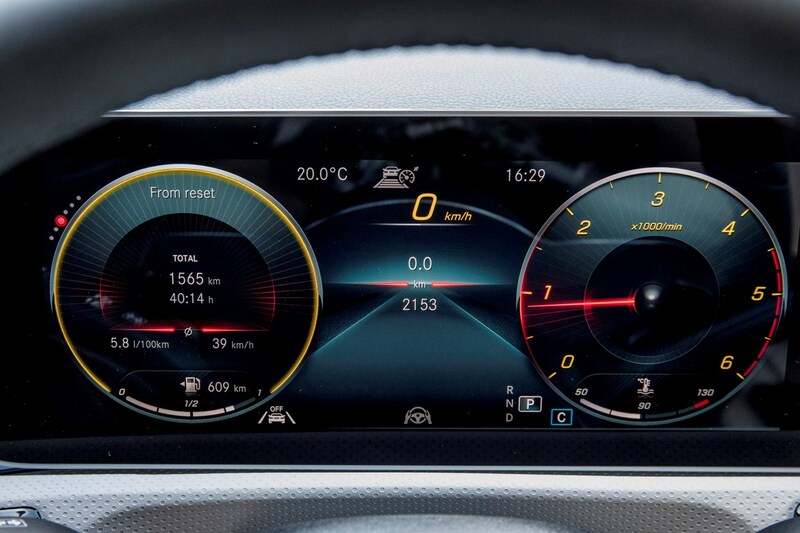 They’re integrated nicely into the cabin and show off crisp, easy-on-the-eye graphics for the myriad menus. 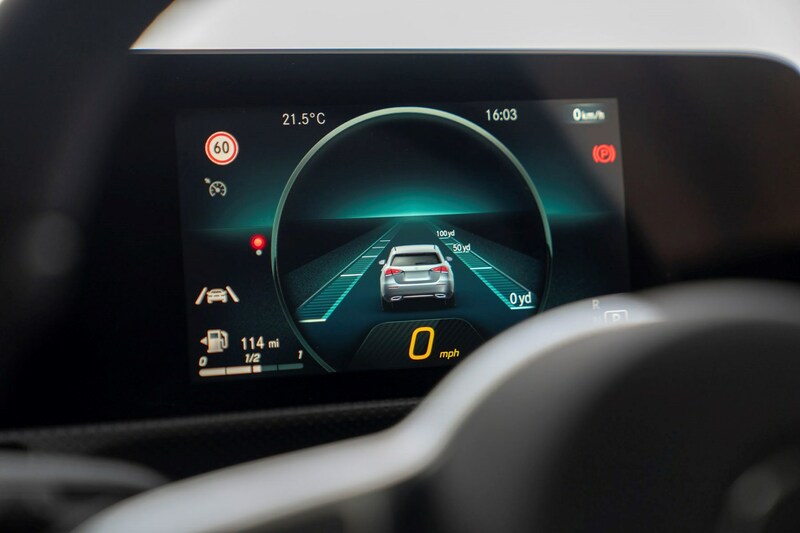 The car’s all-new MBUX infotainment system can be controlled via touchscreen or using the central touchpad, however neither control method is as easy to use as the rotary dial found on the BMW 1 Series and Audi A3. 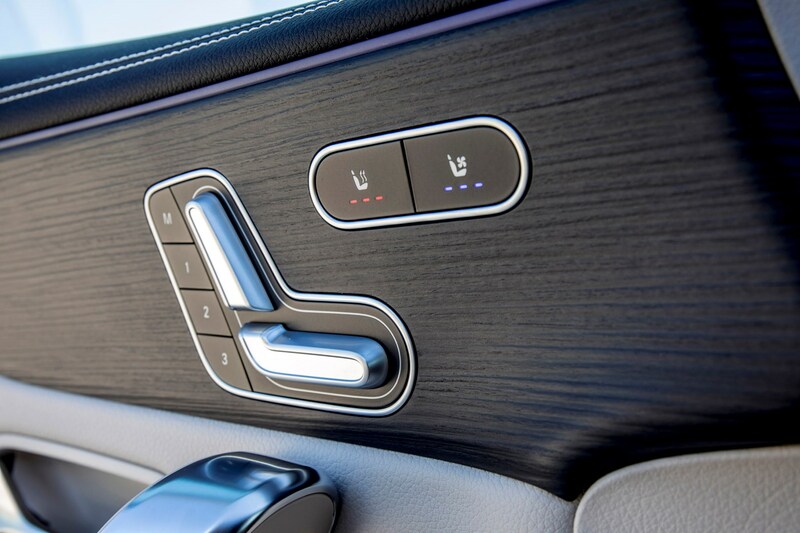 Even so, the menus are slick and relatively easy to navigate – even on the move – and give the car a grown up, high-tech feel. 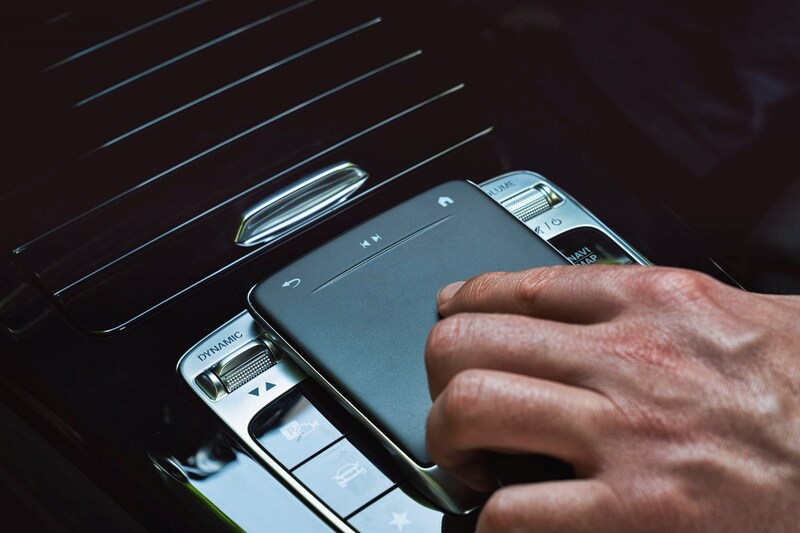 Should you wish, most of the car’s auxiliary functions can be controlled through voice commands. 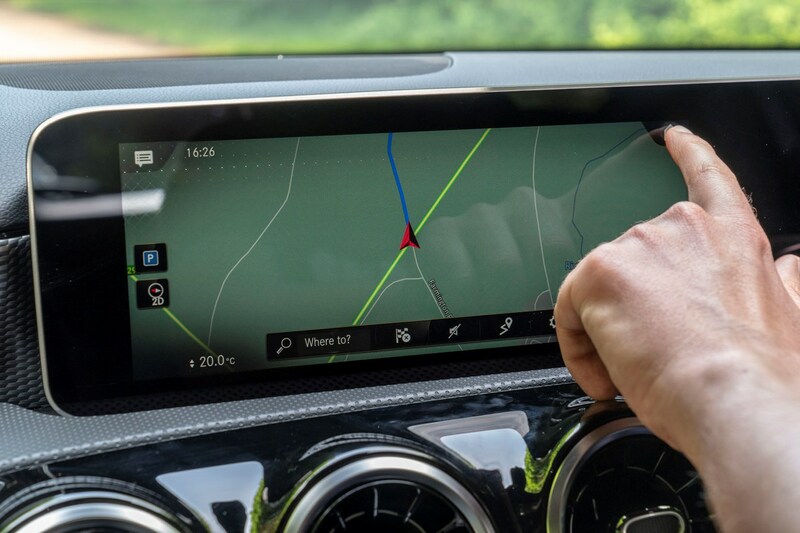 Yes, it doesn’t always successfully interpret your instructions, but requests such as ‘Hey Mercedes, navigate to 1 High Street, London’ are much quicker and simpler than prodding the touchscreen or using the clunky touchpad to enter a destination. However, unless you phrase your request in the correct way, the system can fail to understand, leading to many frustrating exchanges. Still, it will only improve with software updates and as the system 'learns' your voice. 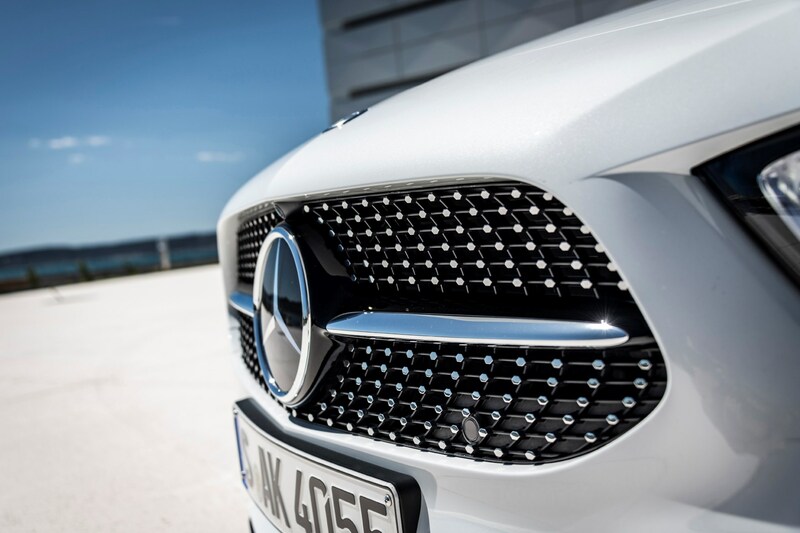 It’s not just the media system you can play with in the A-Class. 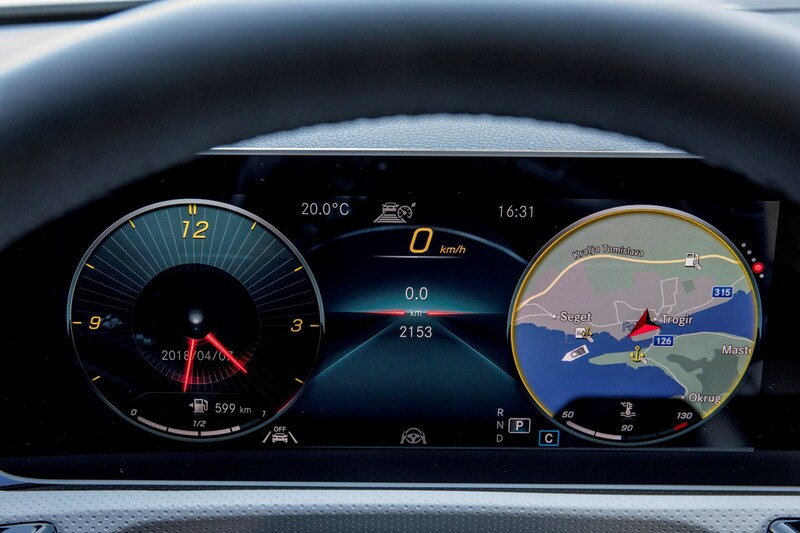 Digital dials are standard, too, giving you the choice between several displays. 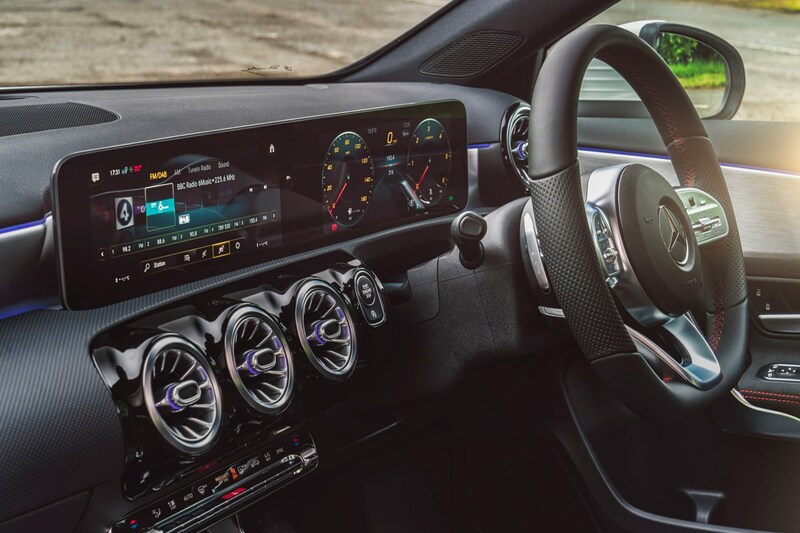 As with the media system, the standard 7.0-inch system looks low-rent compared with the 10.25-inch optional system, which provides the choice between a large, crisp analogue speedometer and rev counter and full-screen sat-nav view plus several other views. 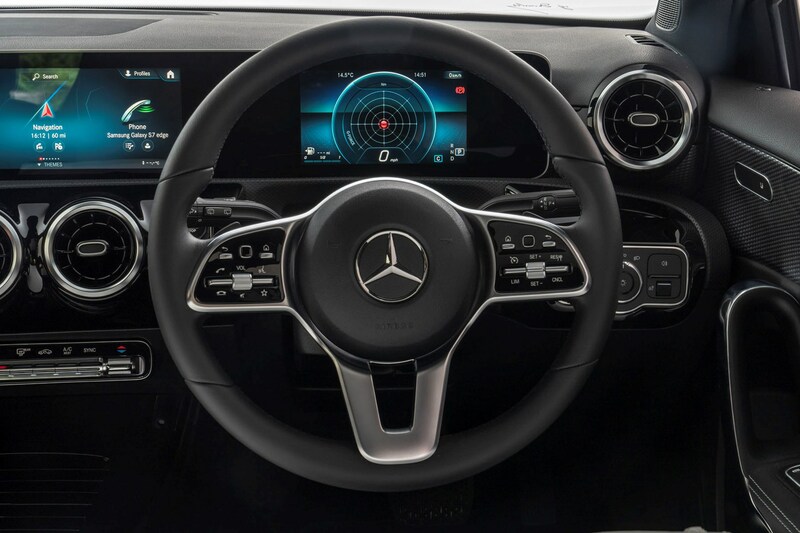 As with pricier Mercedes models, you can control the dials and media system with touch pads on the steering wheel. 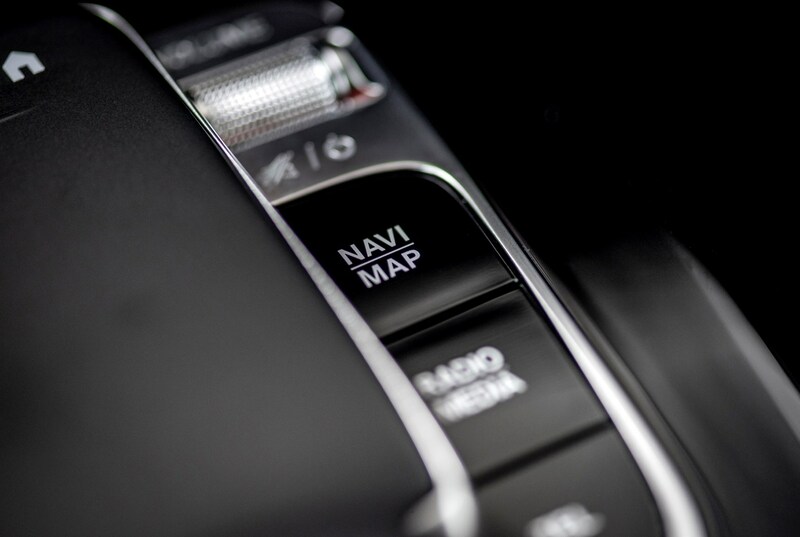 Swipe these and you can shift between infotainment screens on the central display and through menus on the digital dials. 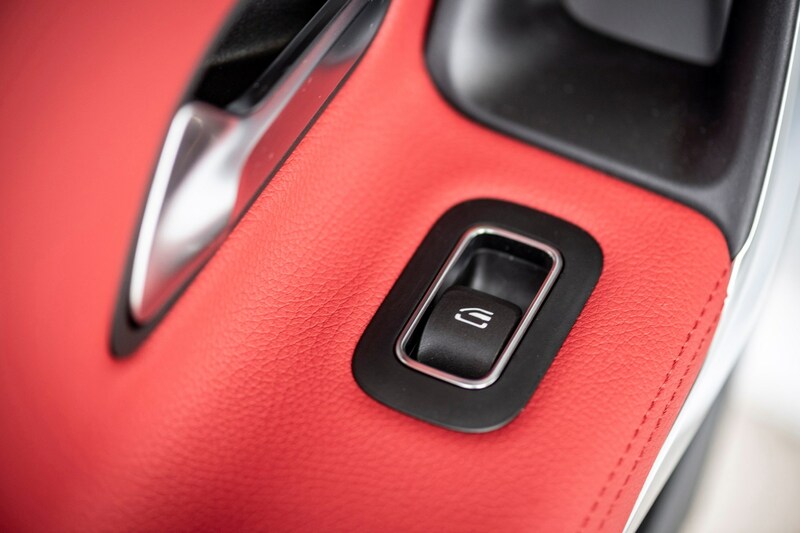 While initially a little fiddly to use, we imagine you’d get use to this quickly if you drove the car every day. 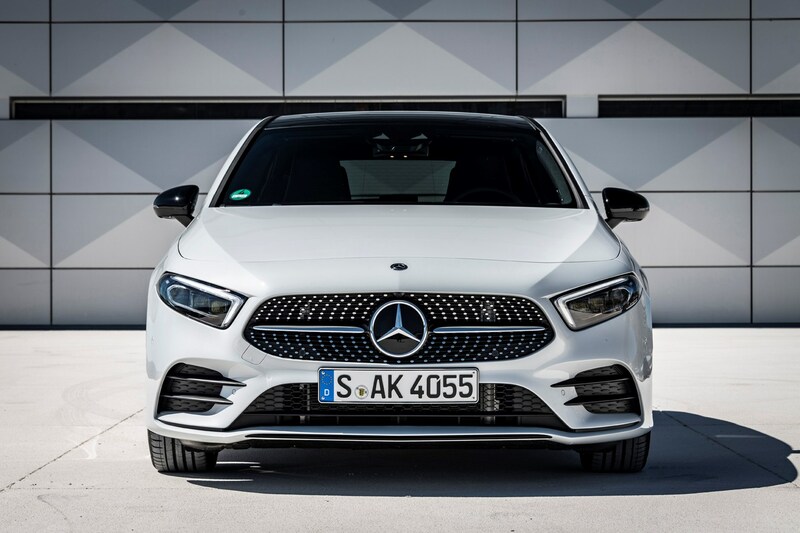 Most drivers will be able to get comfortable behind the wheel of the A-Class without too much trouble. 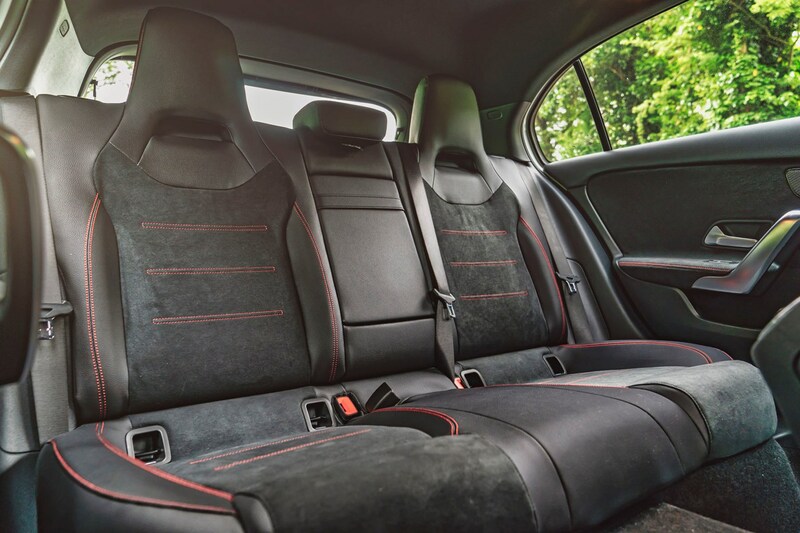 There’s plenty of reach and rake adjustment in the wheel, plus the seats are reasonably comfortable and offer an adequate amount of adjustment. 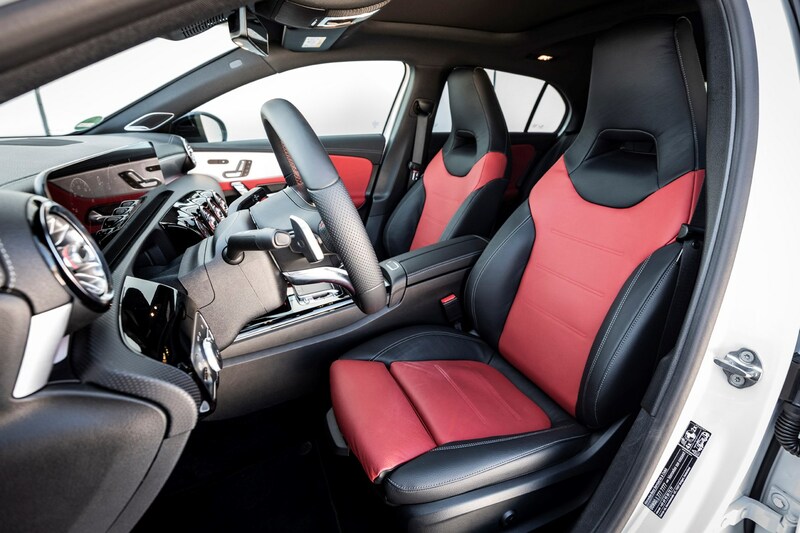 However, taller drivers – or those who simply prefer sitting very low down in the car – will likely bemoan the fact that the seat base is always quite high, regardless of how it’s set. 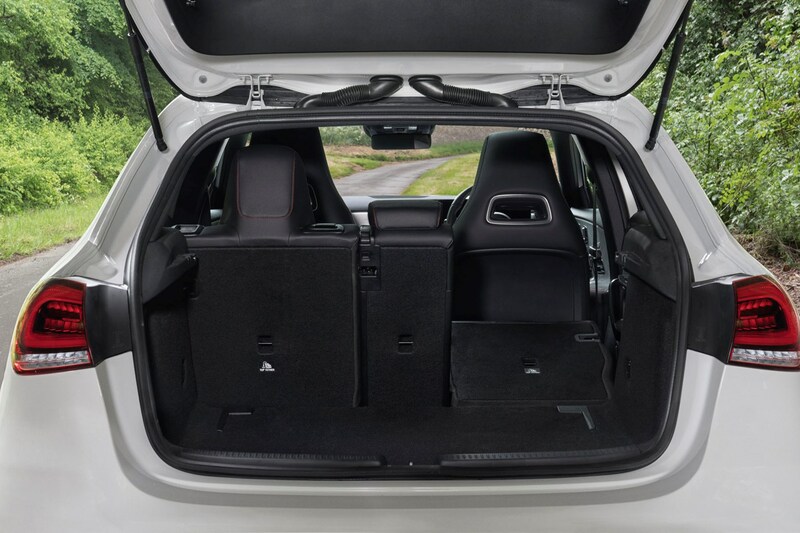 Unlike some, lumbar support isn’t standard either and lower back support is a little lacking, so make sure you can get comfortable before purchasing an A-Class. 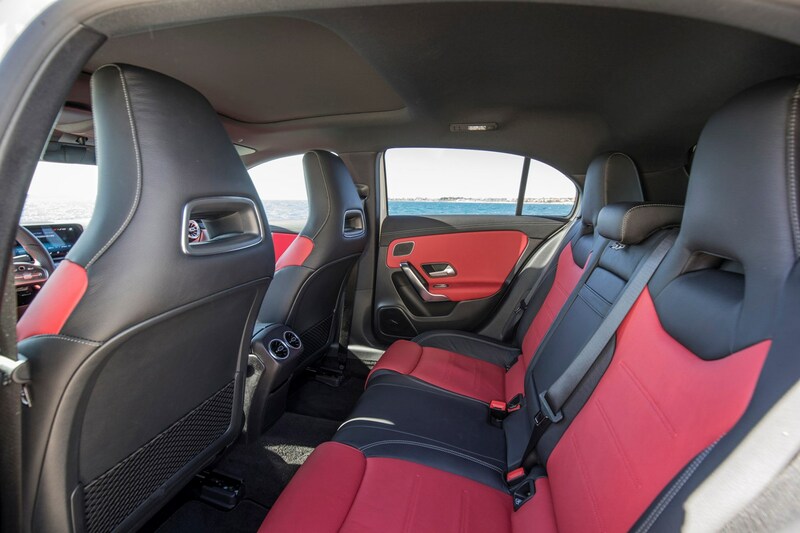 We did find the sports seats in the AMG Line models more supportive than the alternatives in Sport versions, which didn’t provide the most comfortable driving position with inconsistent back padding. Encouragingly, most of the buttons, switches and screens feel like they will stand the test of time. 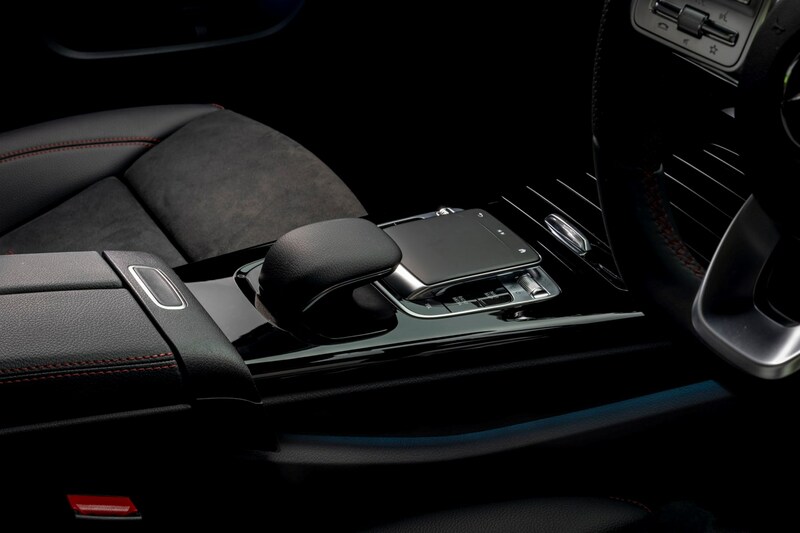 The central touchpad is a particular highlight, and together with its leather hand rest, feels particularly solid and high quality. 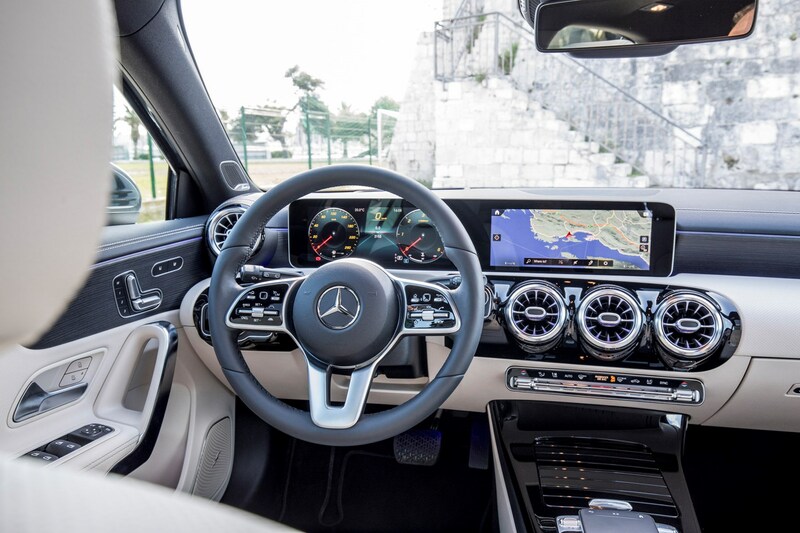 The dashboard sits on two levels and creates what Mercedes calls a ‘ditch’ between the upper and lower deck. It’s a nice idea and allows the central screen to appear as though it is floating, however we’d question how long it would take for the ‘ditch’ to fill with dust and/or other bric-a-brac. 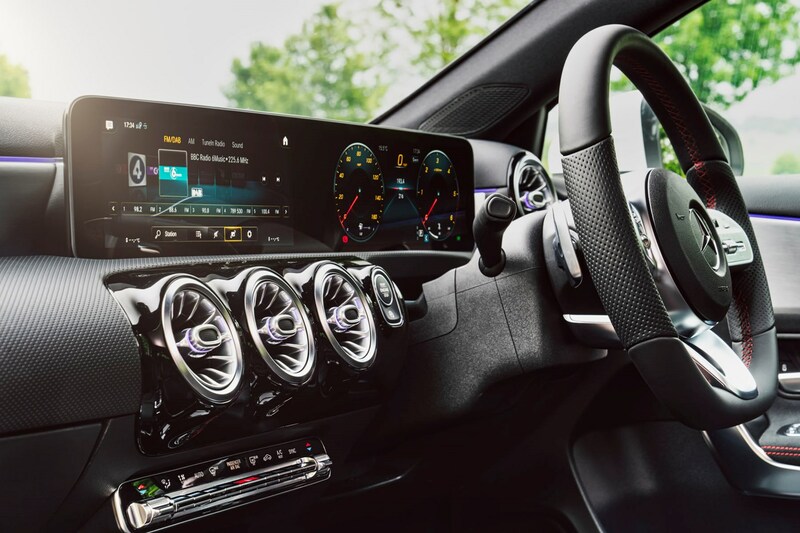 The dash itself features a raft of materials including shiny black plastic, metal-look trim, artificial leather and several types of hard plastic. 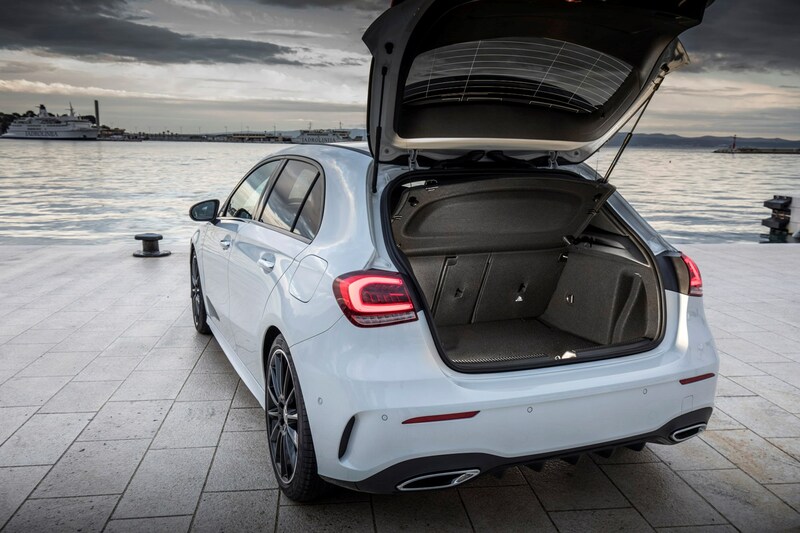 It looks good at a distance, but several parts feel cheap, including the black plastic trim, which quickly becomes covered in finger prints, scratchy feeling interior door handles and sharp-edged plastic on the edge of the transmission tunnel. 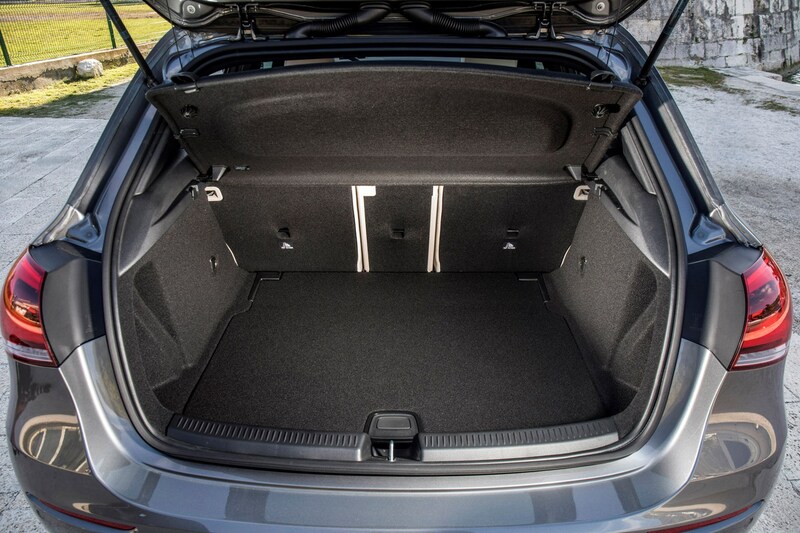 Overall, it feels several rungs below the Audi A3 in terms of how well put together it is and the sheer quality of the materials. 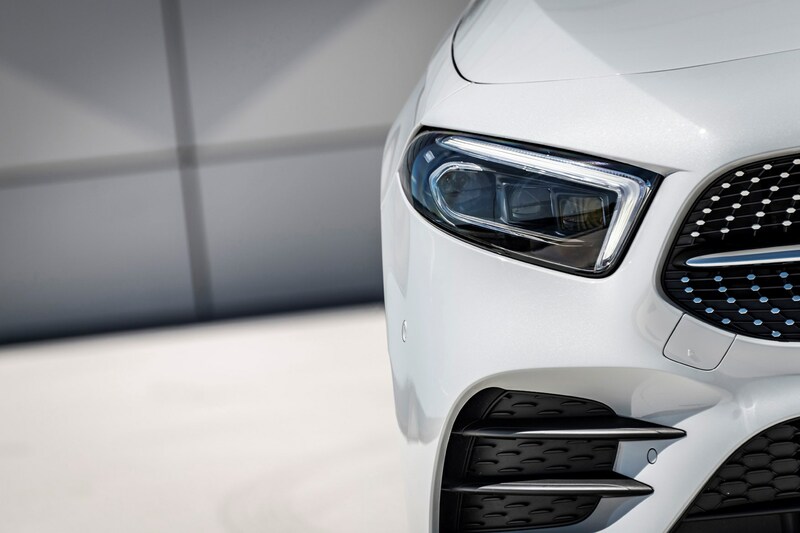 If you want a car that feels expensive rather than just looks expensive, the A3 is a far better choice and the BMW 1 Series also has a more substantial feel. 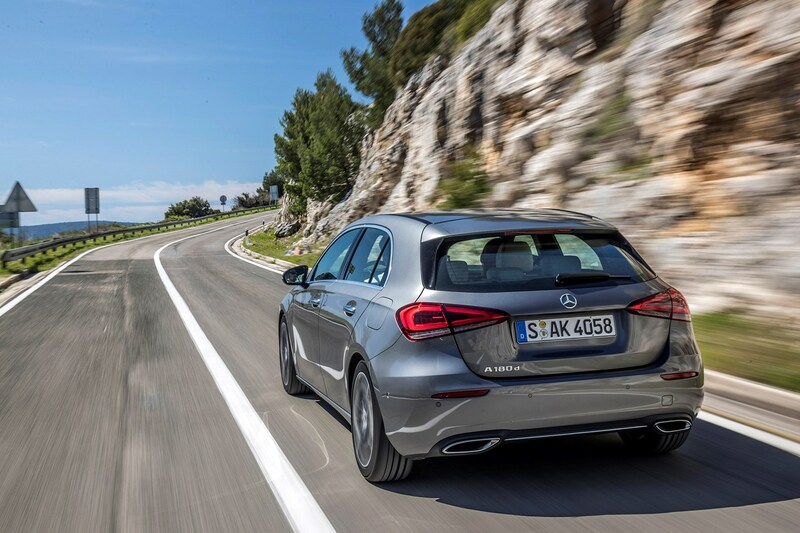 How comfortable your A-Class is depends upon the version you go for. 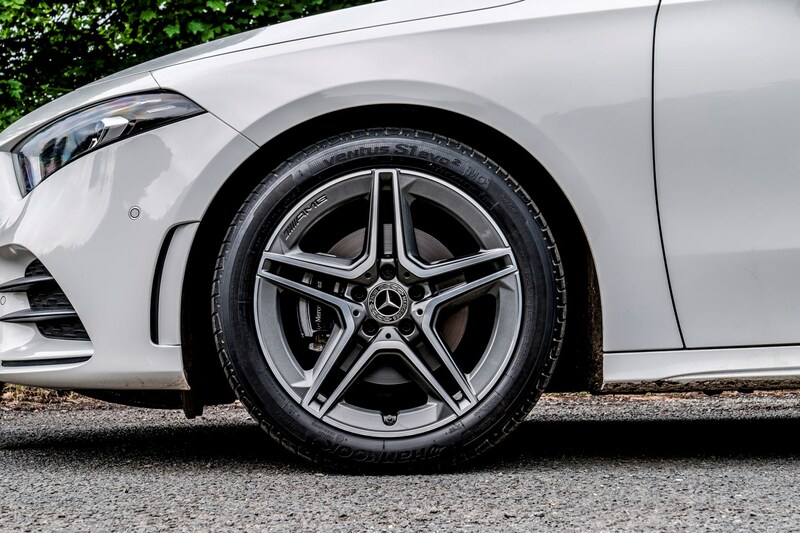 AMG Line versions come with a sophisticated rear suspension set-up, while cheaper SE and Sport versions have a compromised cost-saving format that hinders ride quality. 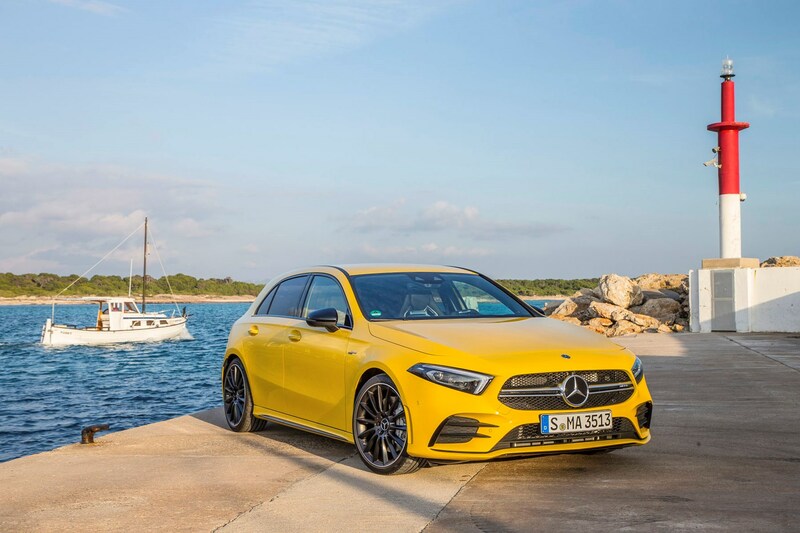 In reality this is balanced out by SE and Sport versions featuring 16- and 17-inch alloy wheels respectively, with more rubber separating passengers from the road compared with the 18-inch ones on the AMG Line cars. 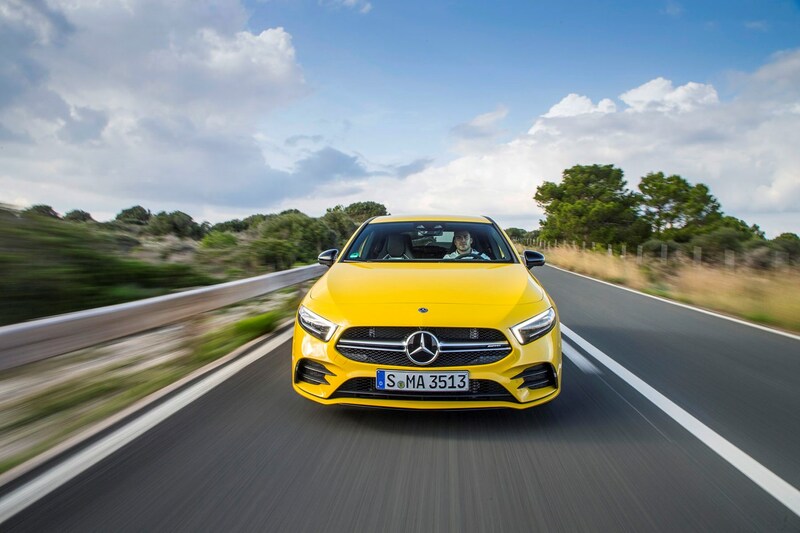 As a result, you can expect AMG Line models to prove firmer but quicker to settle over scarred roads, while SE and Sport models are softer but less able to smooth away bumpy surfaces. 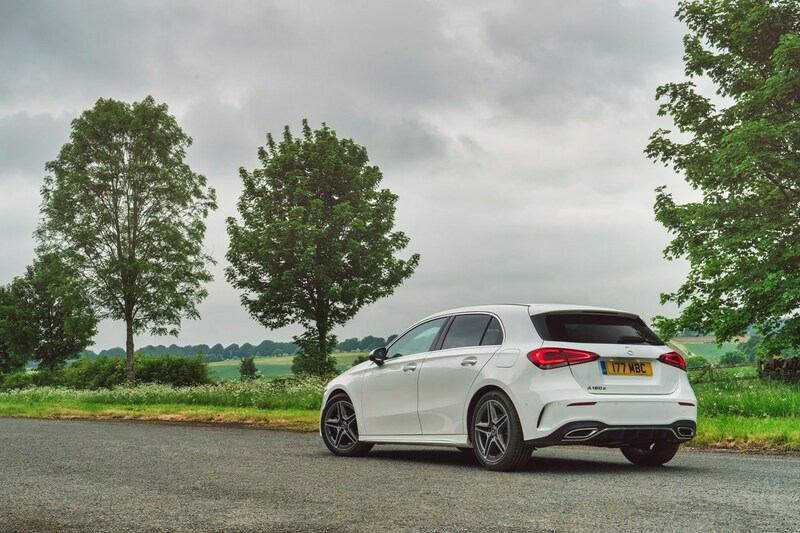 The A-Class has been set up for comfort over sportiness, but it’s far from cushy in normal driving and is more than agile enough around corners for most drivers. 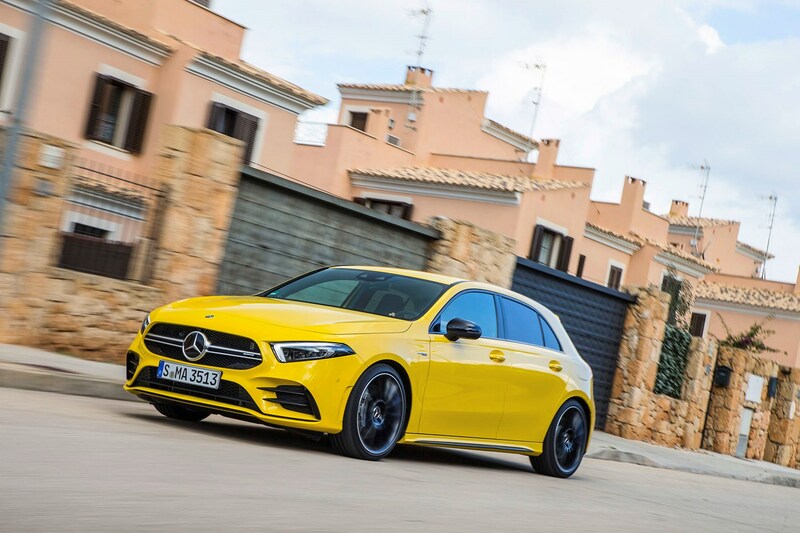 Go for a Sport model on 17-inch wheels and the ride is more compliant than with the AMG Line alternative, though it’s still bobbly over rougher tarmac. 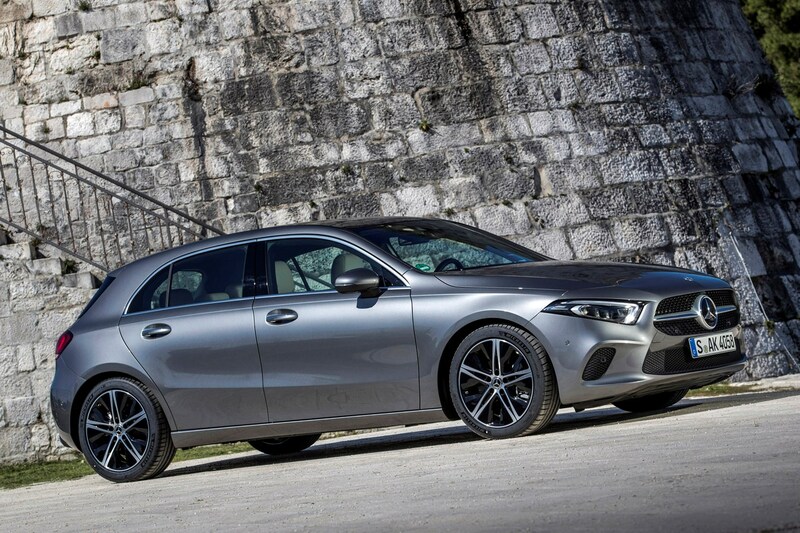 You’d expect a more composed ride in a Mercedes, though it’s fine on the rare stretches of fresh tarmac. Disappointingly, we also noticed a few clonks from the suspension over bumps, which undermine the car’s upmarket billing. 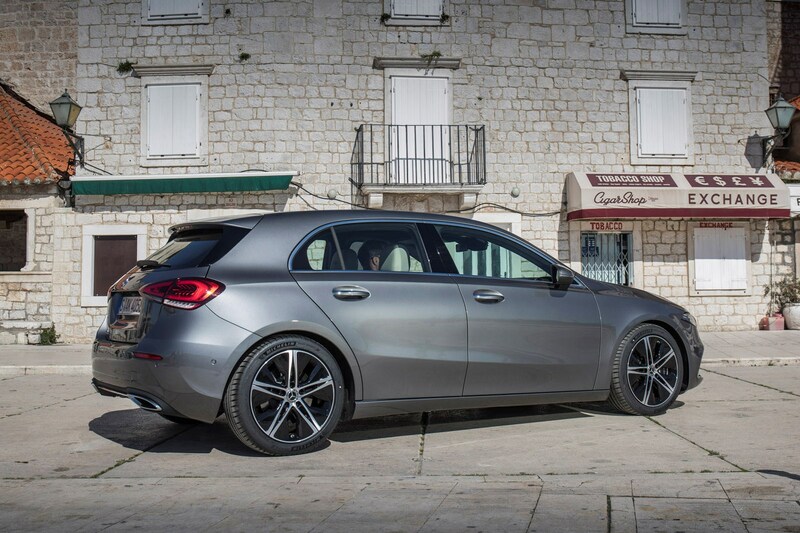 It seems that Mercedes has focused its attention on things other than the suspension in the A-Class. 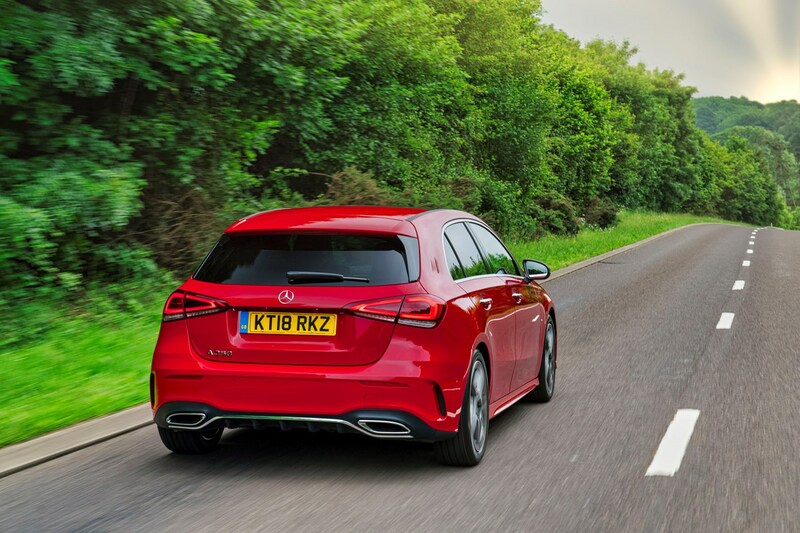 Thankfully, the smaller wheels of Sport models produce less tyre noise, making for a much quieter cabin, though whichever A-Class you go for, road noise is often quite loud on anything other than perfect roads. 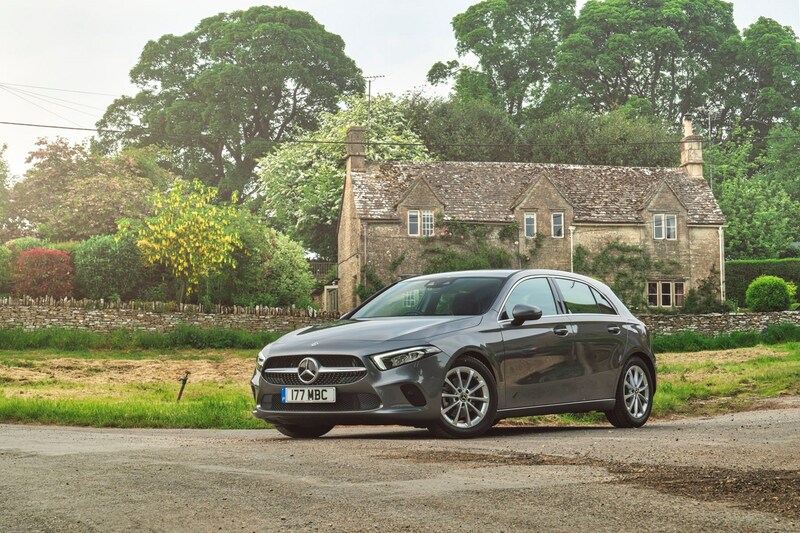 Engine noise is noticeably less than in the previous generation A-Class, especially when it comes to the A 180 d diesel version. It’s still noticeable when revved hard, yet represents a marked improvement elsewhere in the rev range – proving extremely refined. 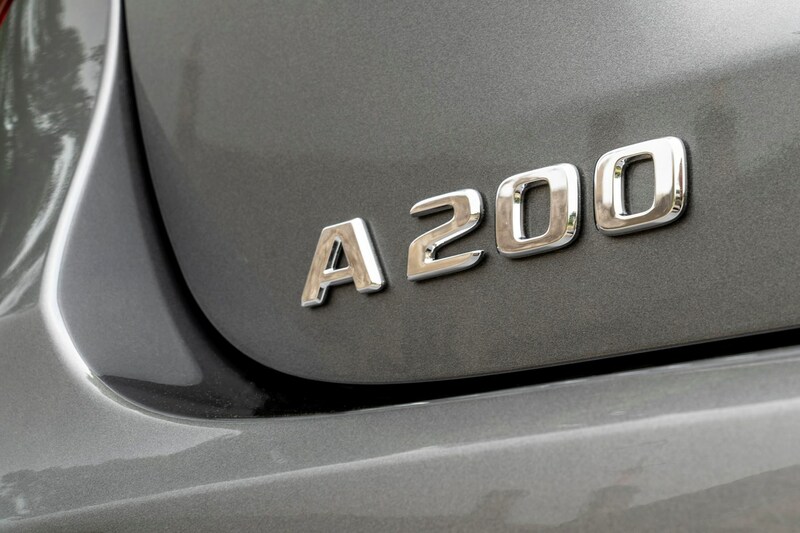 The A 200 petrol is quieter overall, yet it is far coarser than other small turbocharged petrols in rival vehicles – disappointingly so for a car that could easily cost you more than £30,000 or £400 per month on PCP finance. Wind noise from around the rear windows was surprisingly noticeable, too, though this is partly because there is very little noise from around the windscreen at speed. Front seat passengers should still be able to have a relatively hushed conversation, nonetheless. 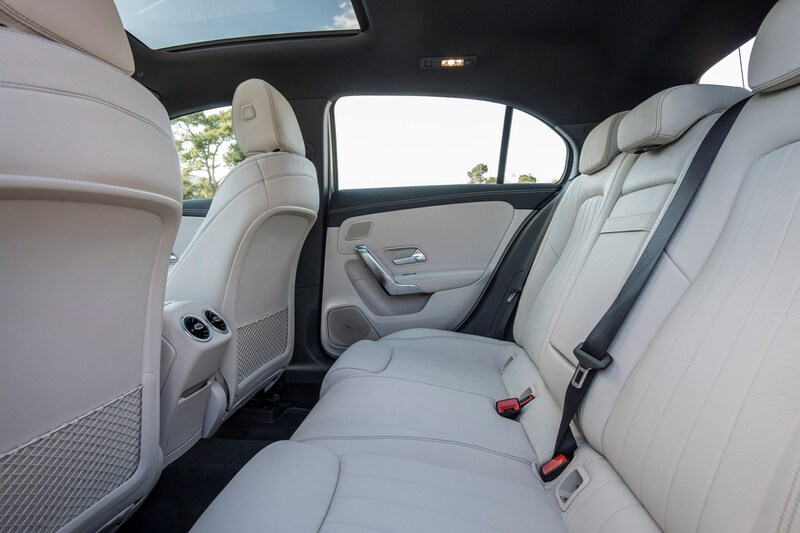 Most drivers should be able to get comfortable in the A-Class thanks to supportive seats and reasonable amounts of adjustment. 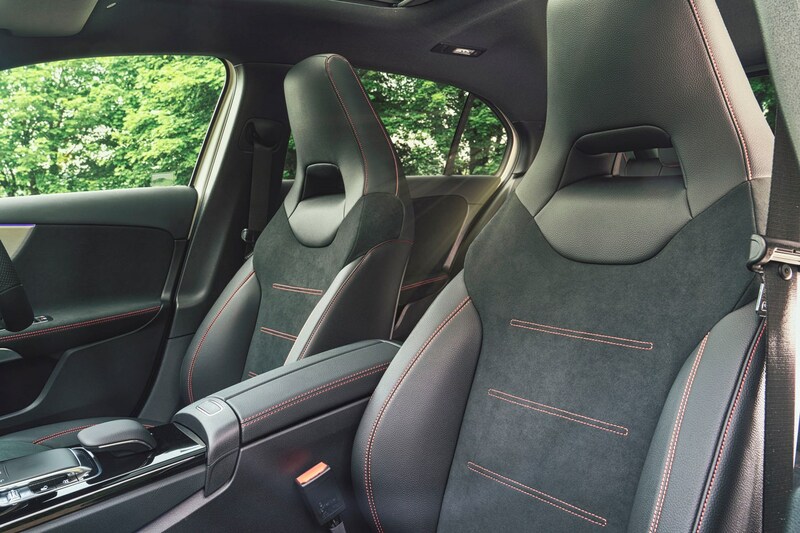 However, particularly tall drivers may struggle to get comfortable behind the wheel thanks to a seat base that still sits fairly high, even on its lowest setting. 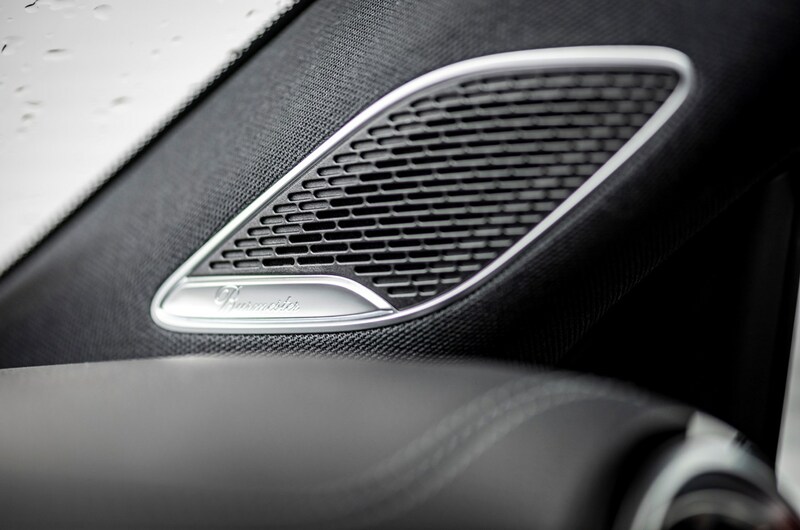 Heated and ventilated seats are available as options on the A-Class.